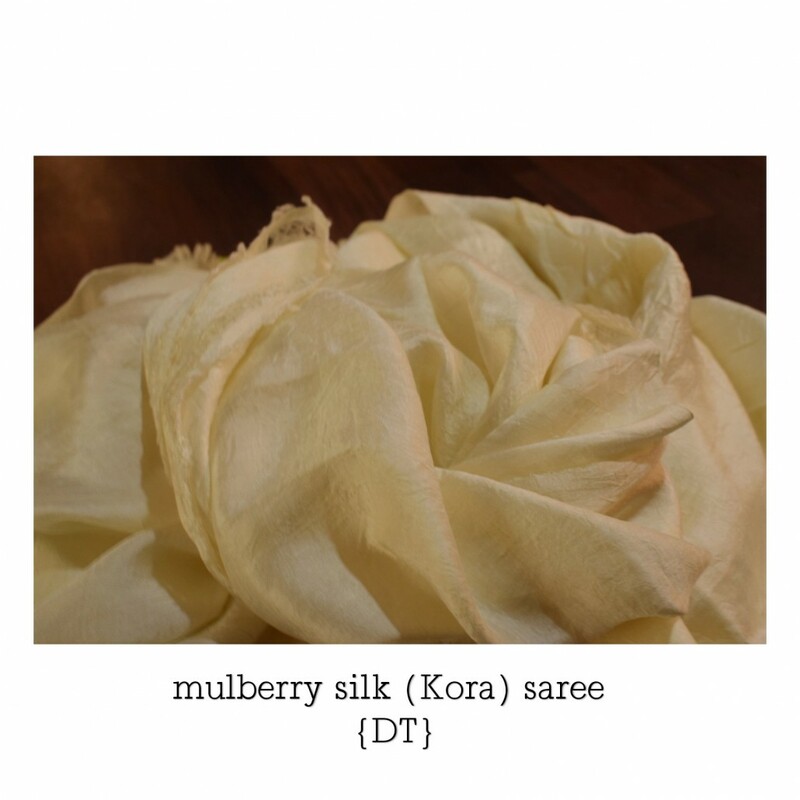 India’s heritage of dyes extracted from flower, leaf, fruit, bark, stone and other bounties of nature is the story of a remarkable 5000 year old tradition in continuum. 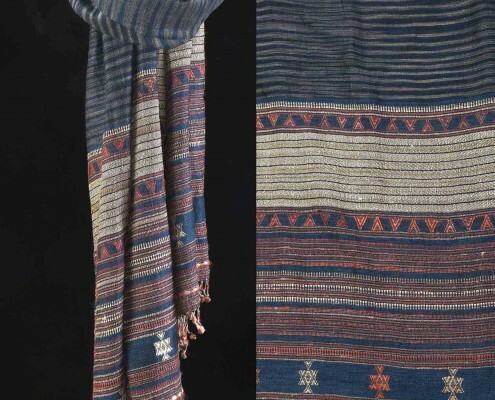 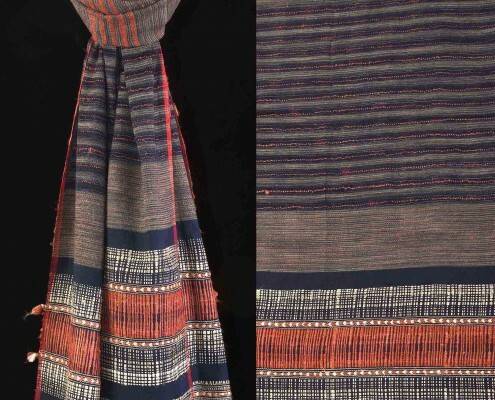 It stretches from the scrap of madder cloth excavated at Mohenjodaro, the indigo fabric found in Pharaoh Tutenkhamen’s tomb, the Biblical reference to the ‘fastness of India dyes’, the painted caves of Ajanta, the block printed clothes worn by royalty in Mughal and Rajput miniatures, to today’s natural dye tradition practiced in many pockets of India. 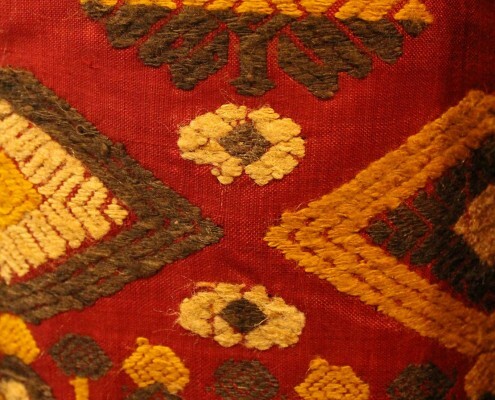 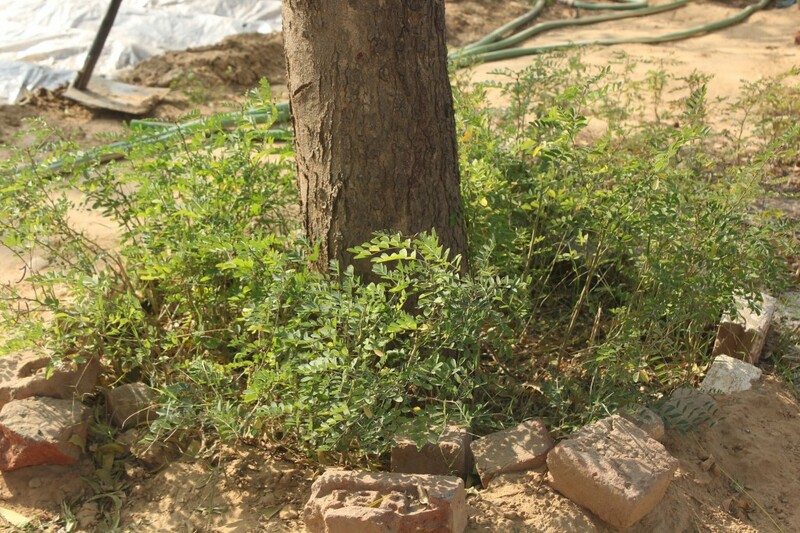 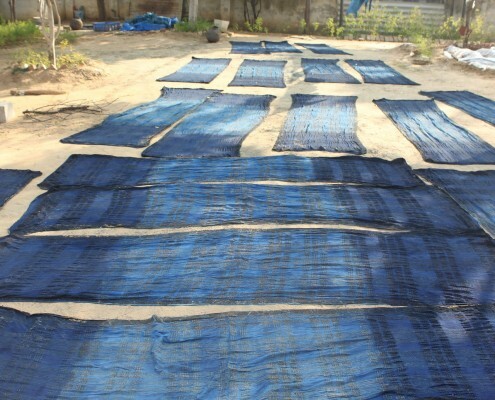 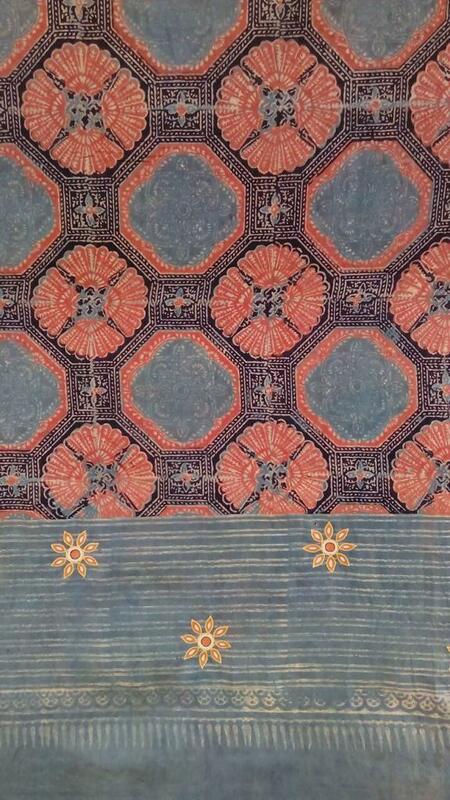 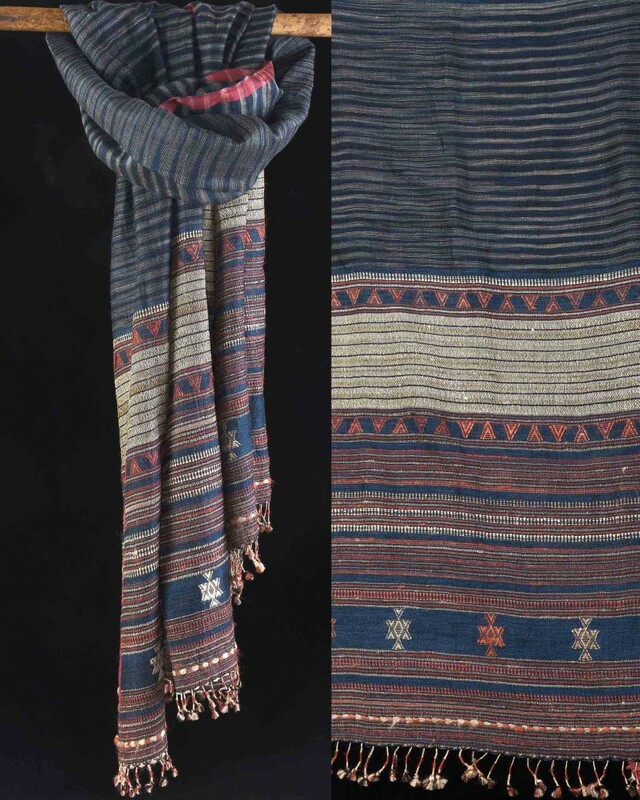 Despite, the fact that some parts of the ancient and medieval world did have plant based dyes such as wood, indigo, madder, etc, till the 19th century, Indian natural dyed fabrics dominated the great trade routes of the world, the courts of Europe and even as cloths of worship in South East Asia. 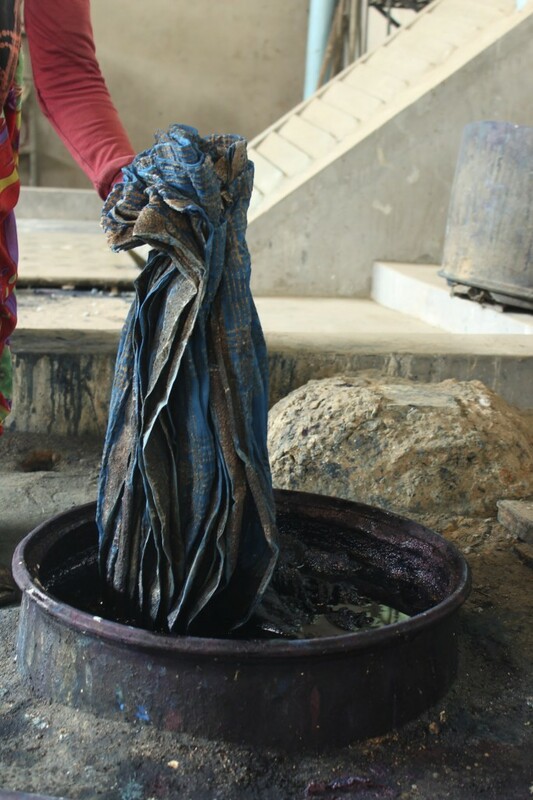 The advent of synthetic dyes with their bright and fast colours in mid 19th century all but destroyed the Natural Dye narrative worldwide including to a large extent, the India story. 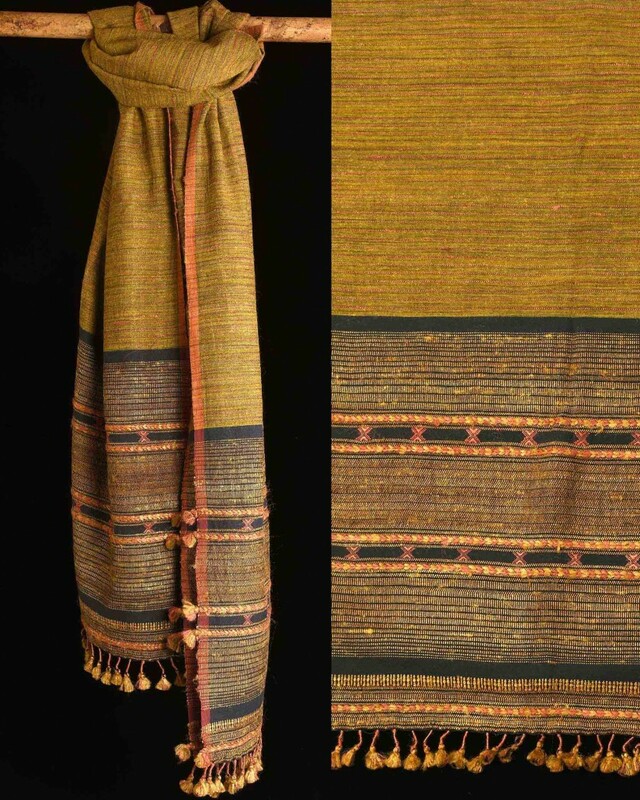 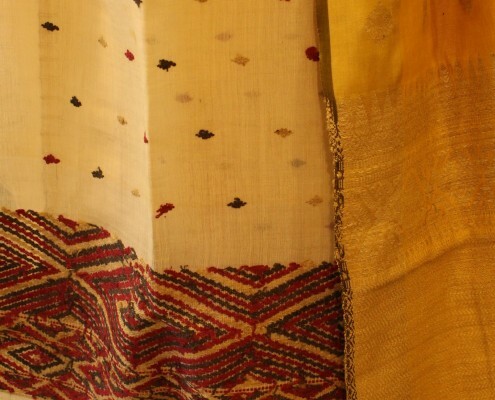 However ‘paramparik’ knowledge and the ‘guru shishya’ dissemination of knowledge being the cornerstone of Indian civilization, pockets of natural dye making and the use of the dye in fabric, saris and textiles continued, although on a greatly diminished scale. 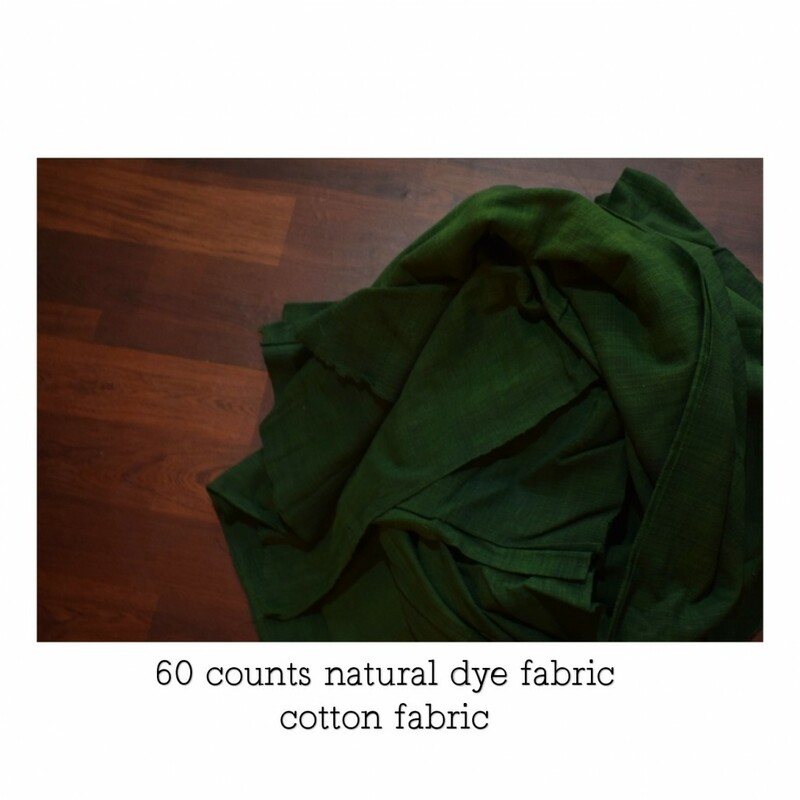 But the last decade of the 20th century and in particular, the early years of the 21st century are witnessing a resurgence of natural dyes. 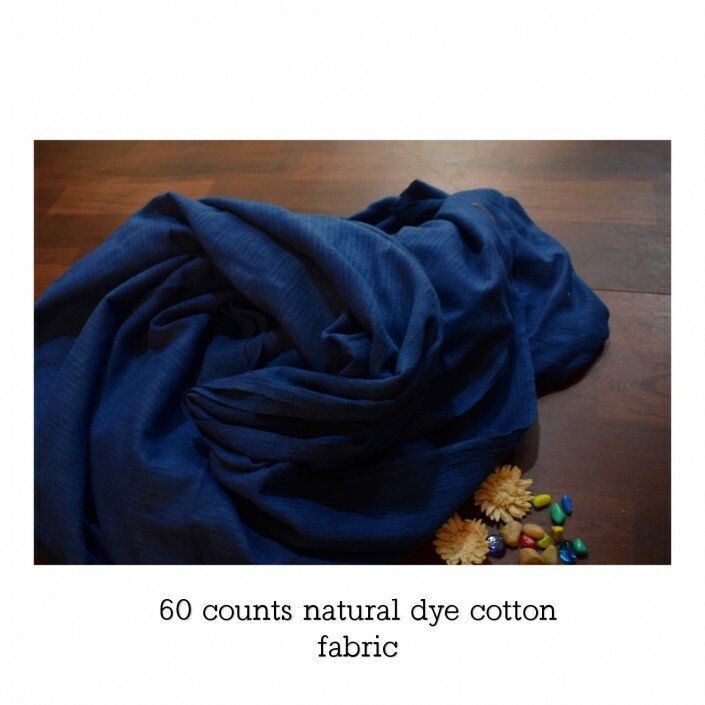 Globally, there is an urgent and growing concern for environmental pollution and ecological devastation as well as knowledge of the health and environmental impact of synthetic dyes. 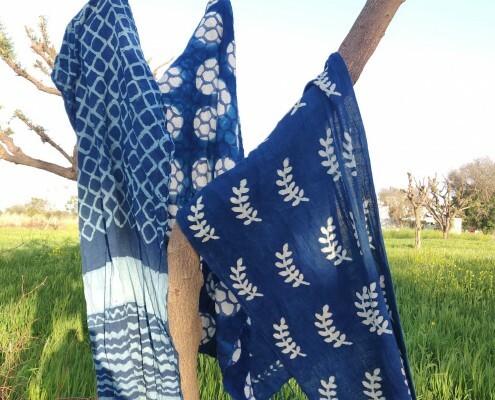 This has led not only to premier couturiers and boutiques to bring out natural dye fashion and prêt lines, but created awareness in growing numbers of India’s middle classes who are beginning to use naturally dyed garments, saris and in even menswear as well . 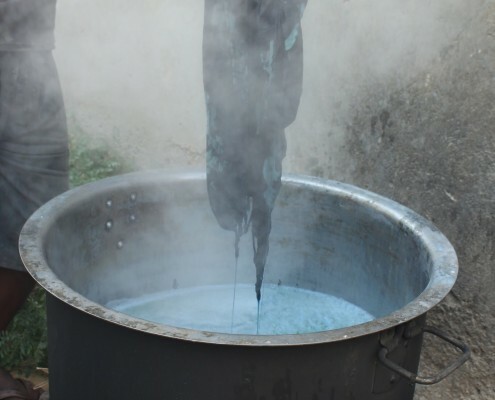 To meet this demand commercial dyers and small export houses are using natural dyes for regular dyeing and printing of fabric. 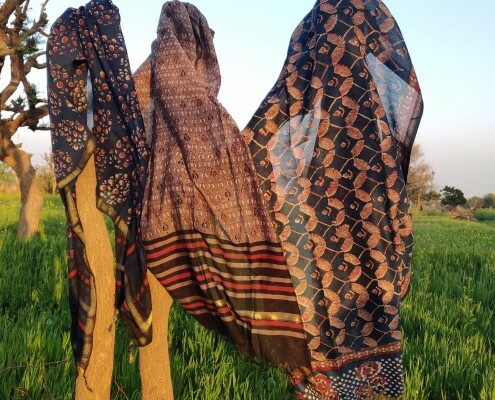 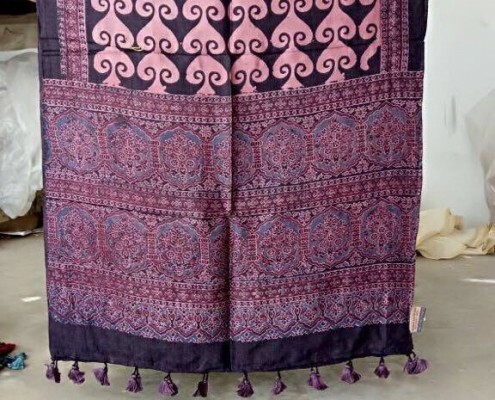 Weavers in Kutch, Manipur, etc where natural dyed fabric is an unbroken tradition are opening start-ups and becoming craftepreneurs of natural dye fabric. 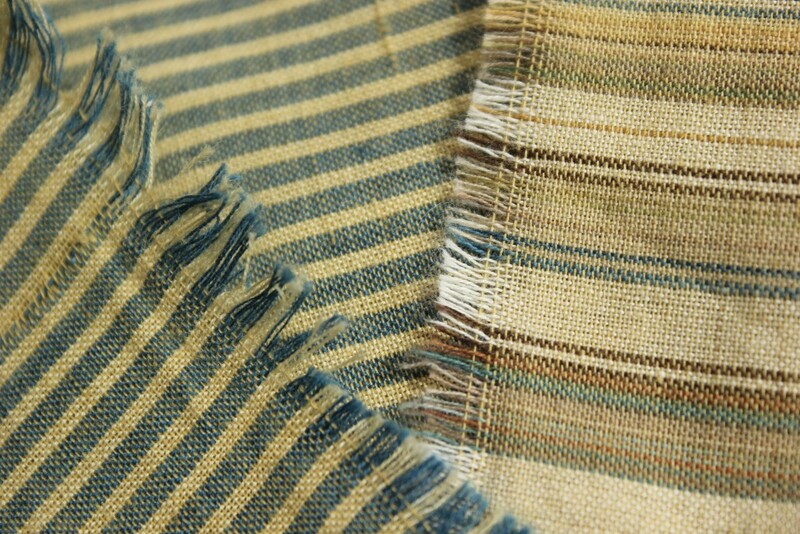 Textile is going back to its ‘natural’ roots in many other areas too. 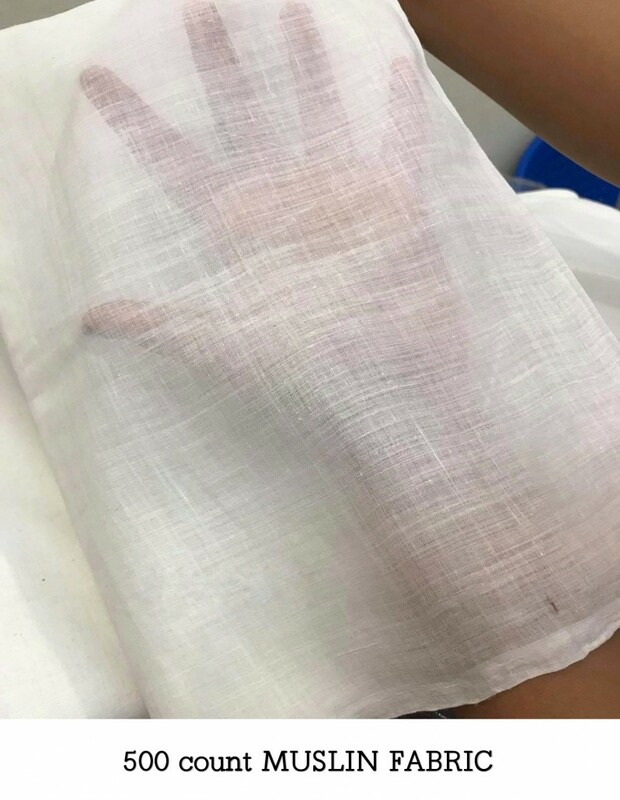 Needless to add that both craft artisans and buyers are happy since synthetic dyes produce skin allergy, breathing problem and toxic wastes, etc. 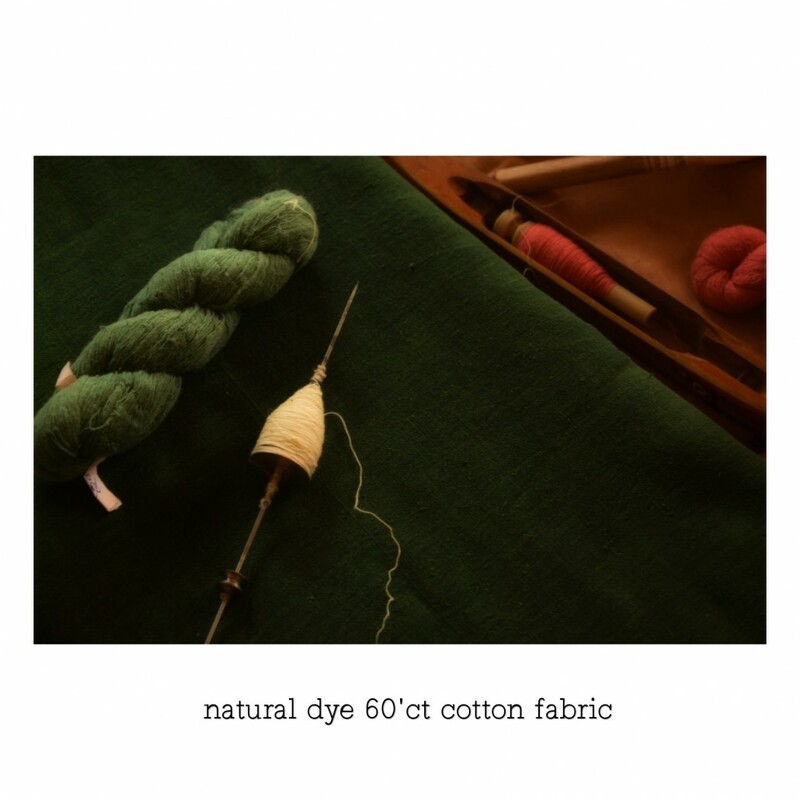 Another plus point is the uncommon aesthetic appeal in the soothing and soft ‘close-to-earth’ colour palette produced by natural dyes. 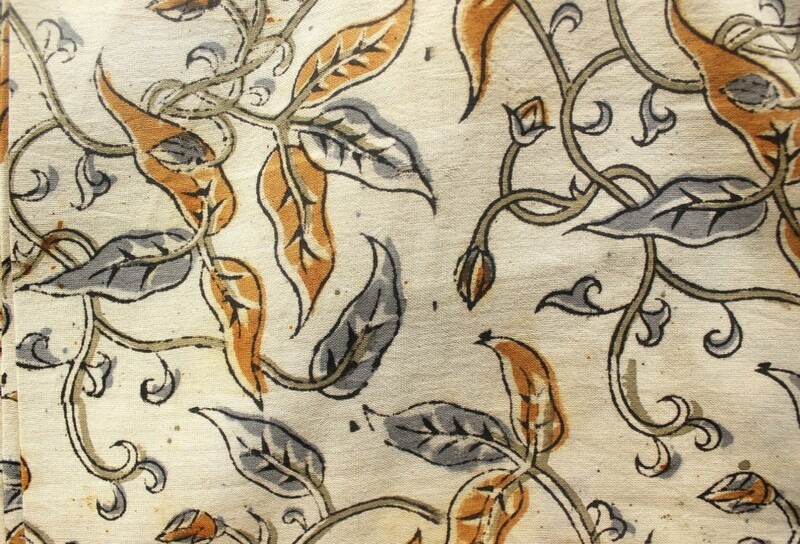 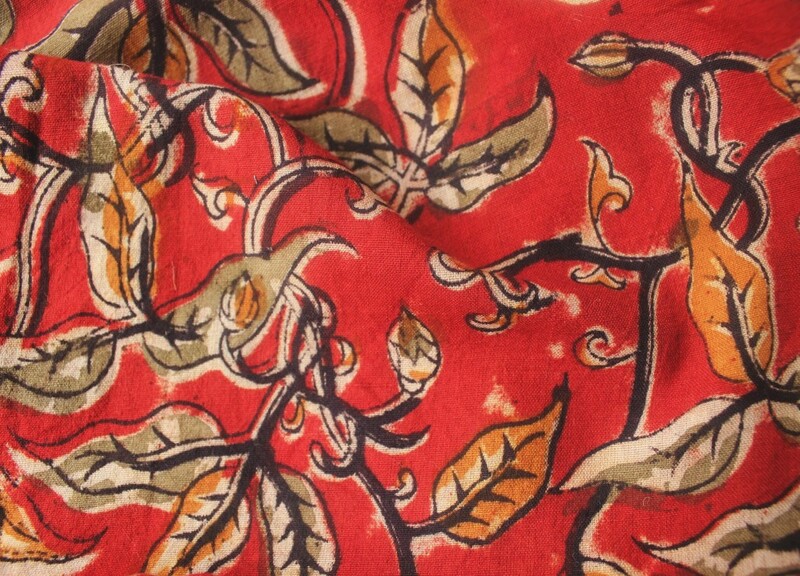 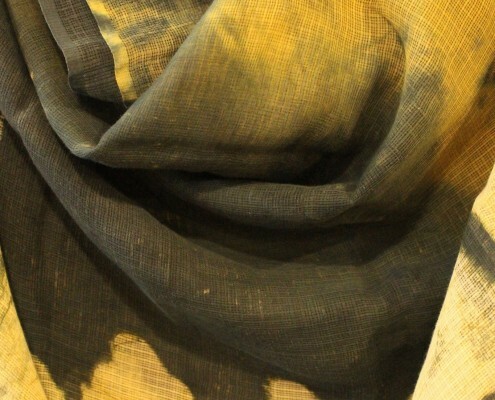 The Crafts Council of India has been at the forefront of the Natural Dye Revival movement. 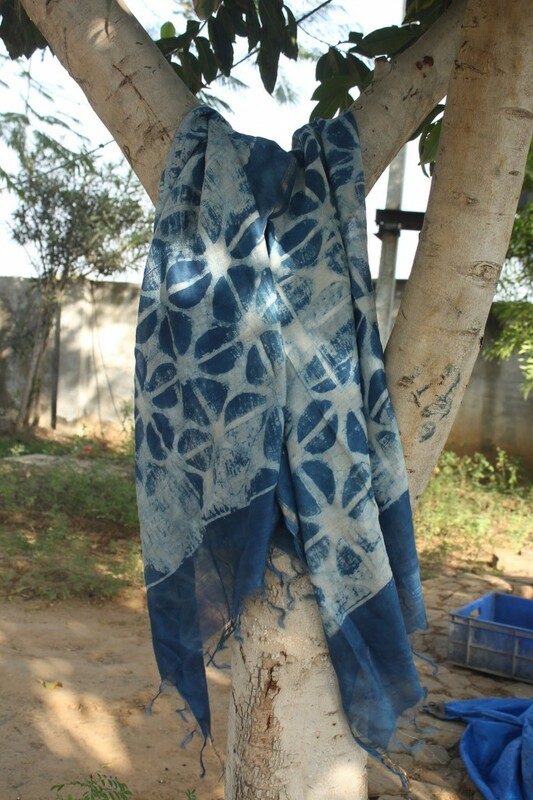 CCI was involved in the organisation of the UNESCO sponsored International Natural Dye Symposium held in Hyderabad in 2006. 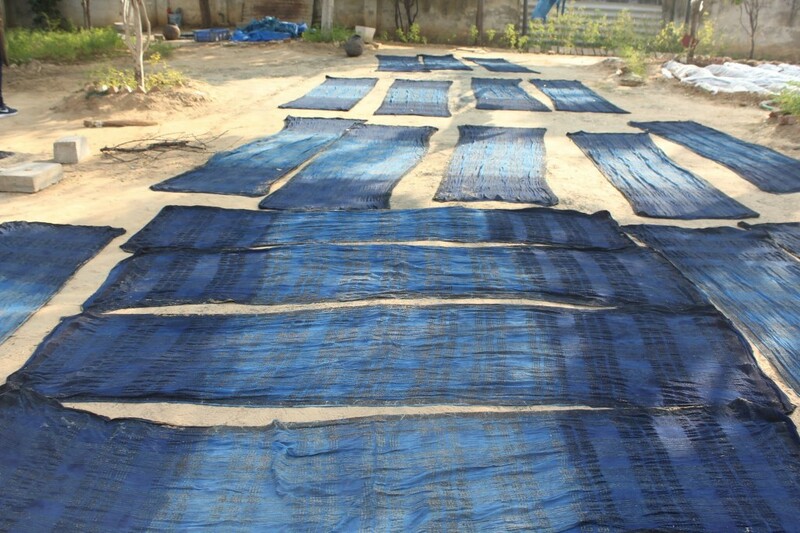 It held the highly acclaimed and successful Natural Dye Exhibition in Chennai in 2006 and 2017. 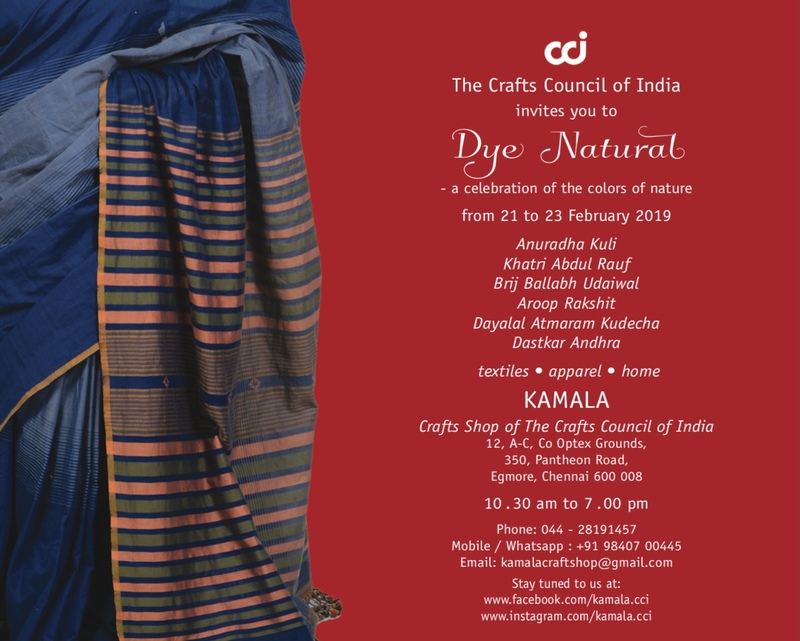 And now its time for CCI’s ‘Dye Natural’ in Chennai , a celebration of the colours of nature in the textile ouvre of 6 well known artisan brands: Dastkar Andhra, Dayalal Kudecha, MG Gramodyog Sewa Sansthan, Brij Ballabh, Abdul Rauf Khatri and Anuradha Kuli. 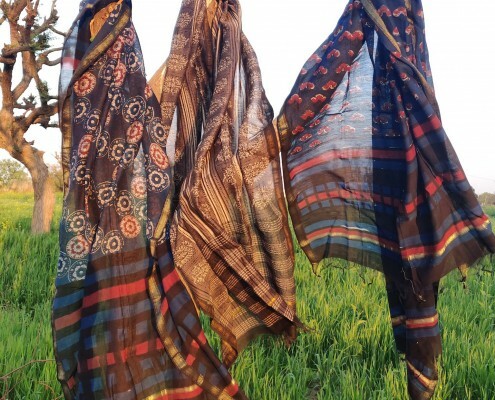 Crafted and created by the artisans – the saris, stoles, fabrics and dupattas will carry the exquisite freshness of natural dyes and imprints of these master artisan’s work. 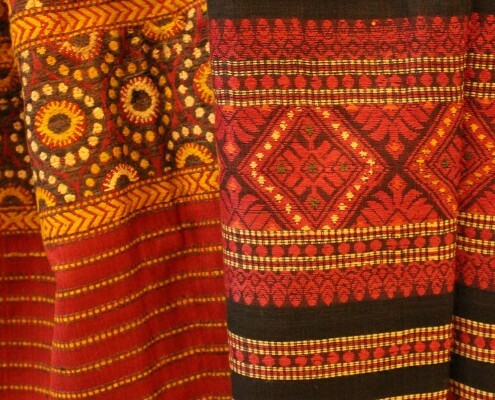 Look for Dayalal Kudecha’s unique Bhujodi weaves, Abdul Rauf Khatri’s wondrous double-sided Ajrakh block prints, Dastkar Andhra’s soft palette of natural dye shades, Mahatma Gandhi Gramodyog Sewa Sansthan’s ethereal revival muslins and khadis, Anuradha’s Kuli’s wondrous weaves from the North-East and Brij Ballabh’s beautifully conceived Sanganeris. 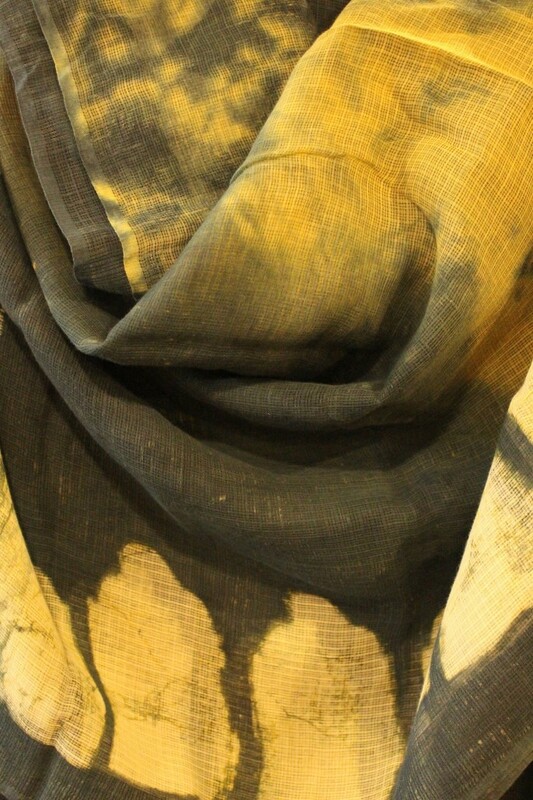 Every textile product on display will tell a story of the great and diverse natural dye tradition of India. 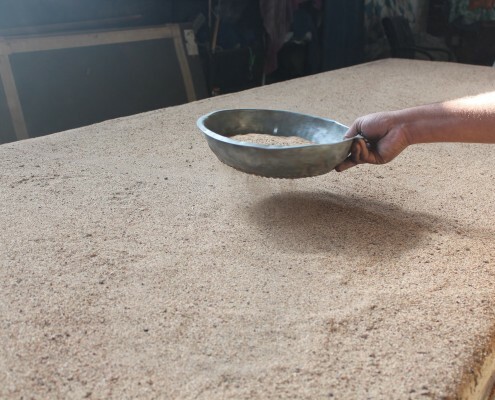 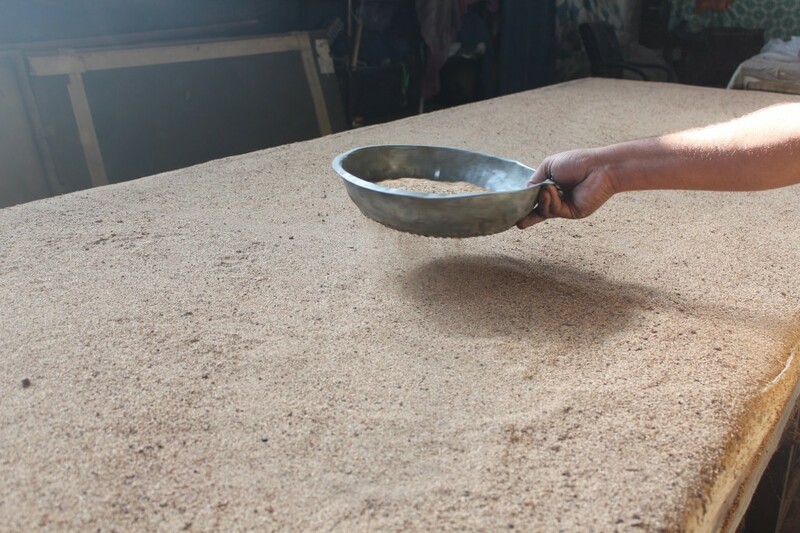 Dayalal Kudecha was born in a family engaged in salt making in Khari Rohan village of Gujarat. 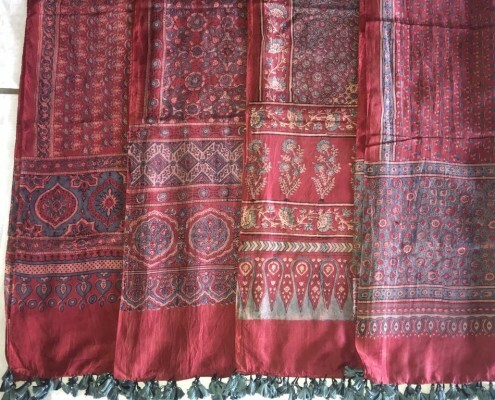 He began to learn weaving when his family moved to Bhuj. 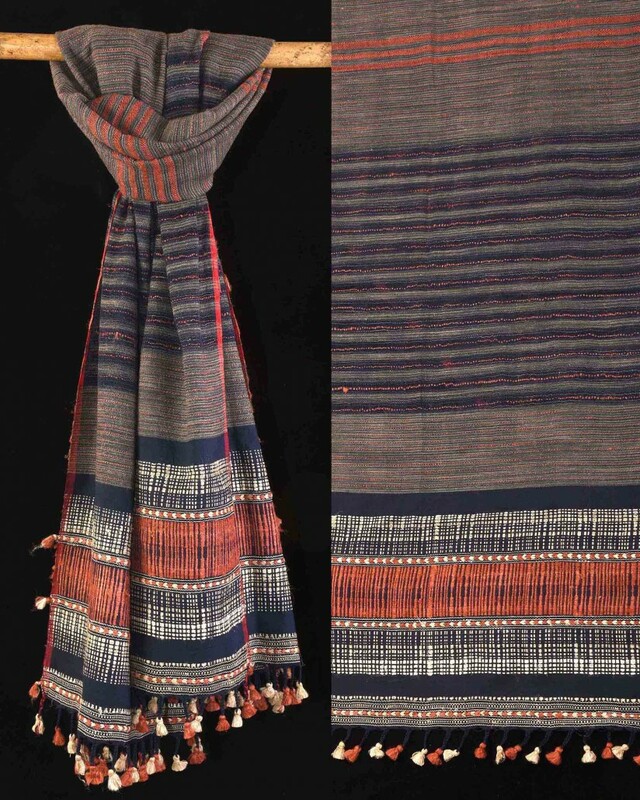 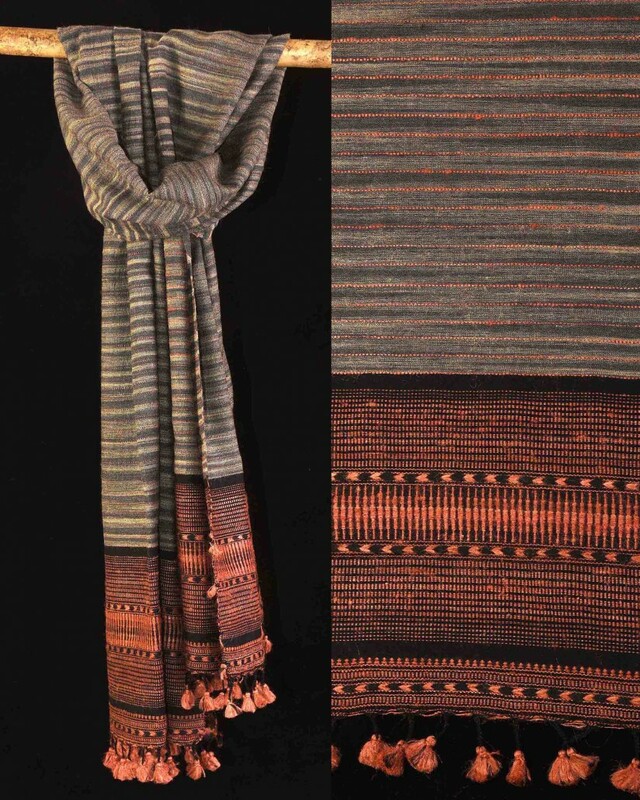 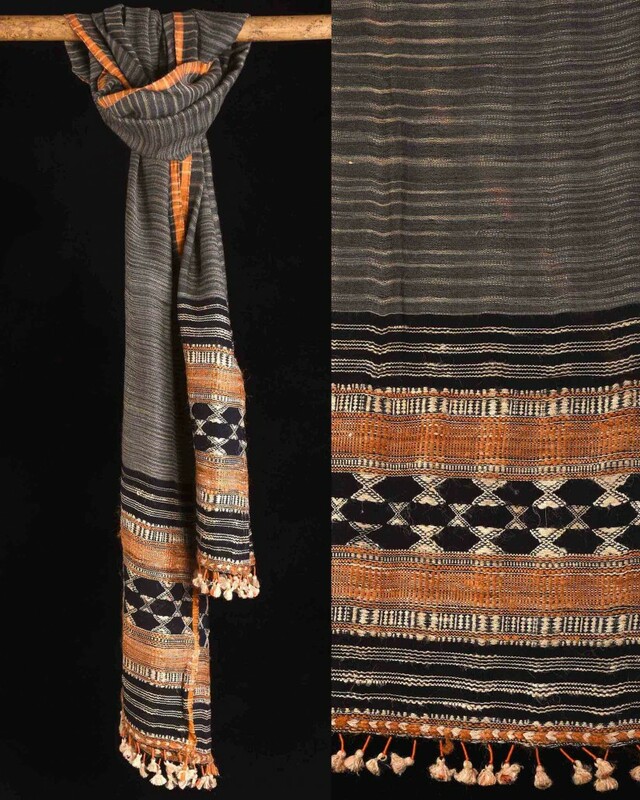 He learnt weaving from a masterweaver and began weaving traditional and contemporary designs for nearly 25 years. 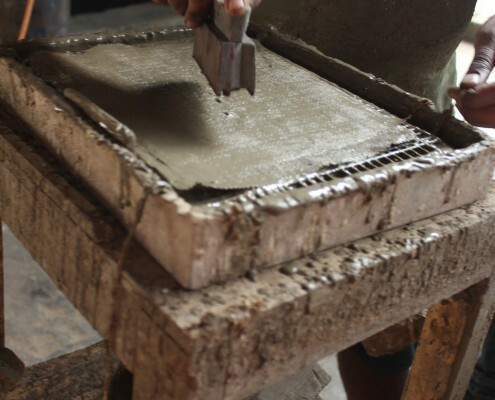 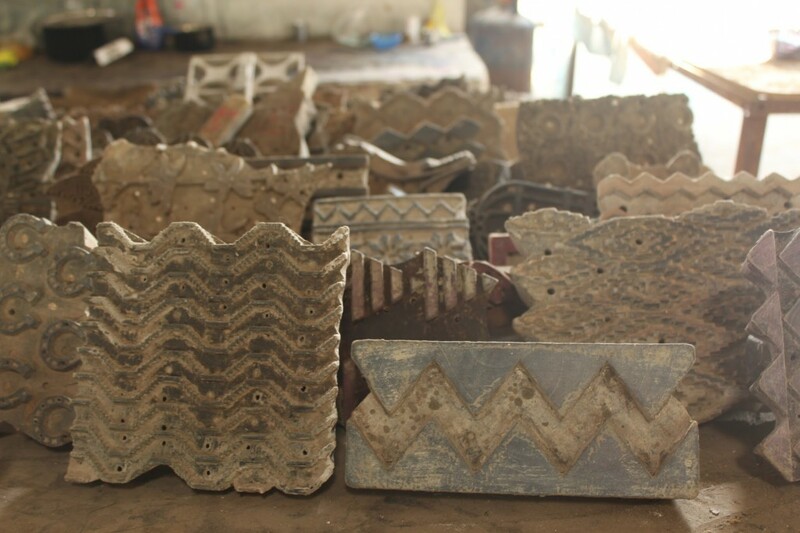 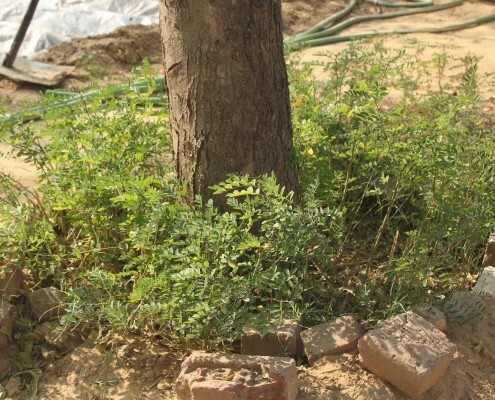 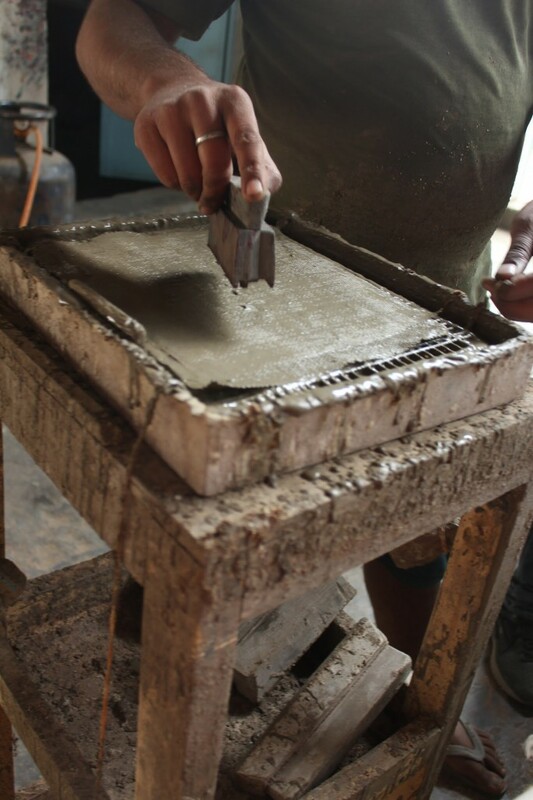 He decided to learn design after the 2001 Bhuj earthquake. 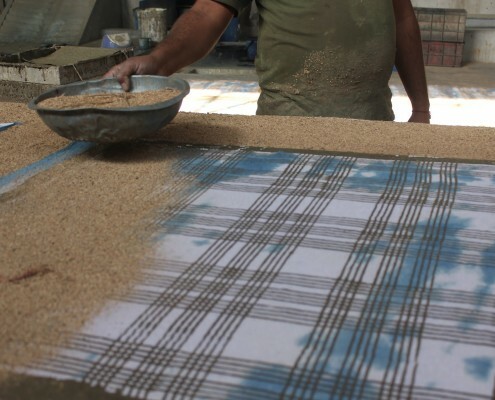 In 2008, he joined the prestigious Kala Raksha Vidyalaya and began to do brilliant innovations within his tradition. 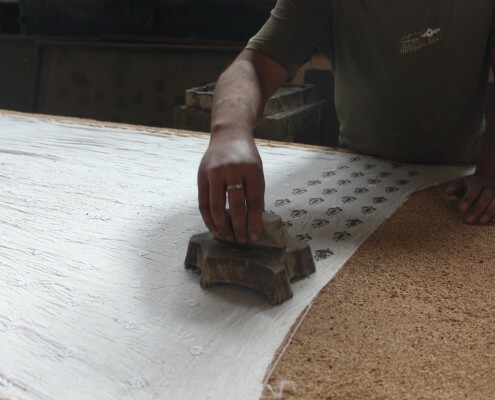 He became part of Kala Raksha Vidyalaya faculty, teaching design to traditional artisans and holding workshops for foreign students. 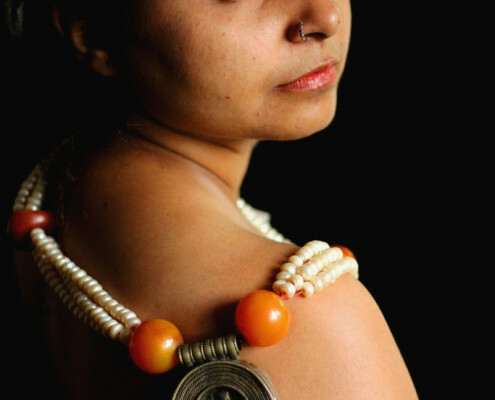 In 2014, Dayalal Kudecha joined Somaiya Kala Vidyalaya as faculty member, teaching both design and business. 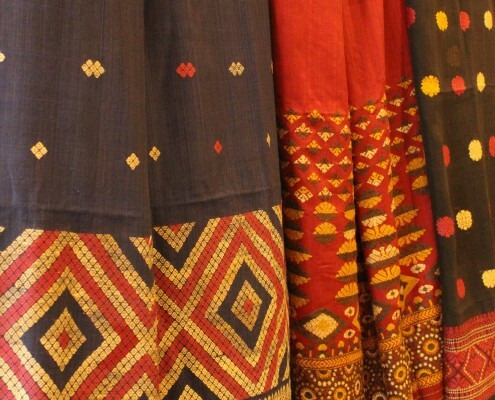 Dayabhai Kudecha’s saris and dupattas on display at ‘Dye Natural’ carry the mesmerising weaves of Bhujodi and the unique colour palette extracted from nature. 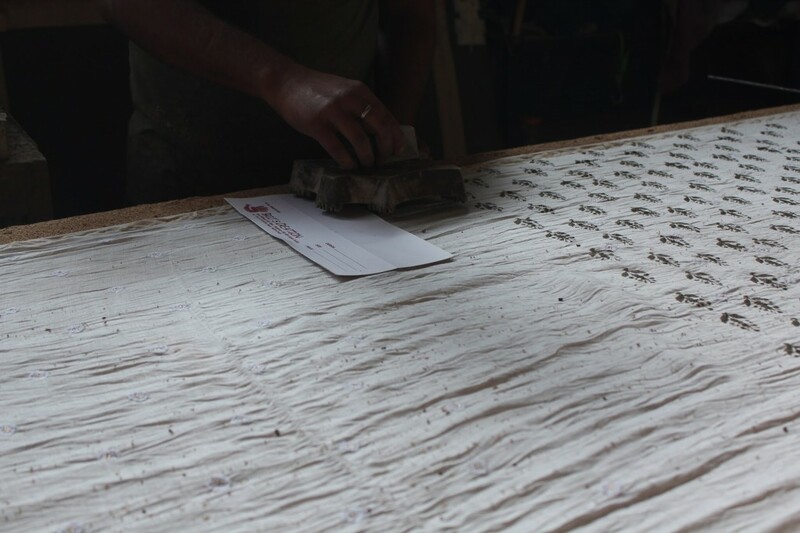 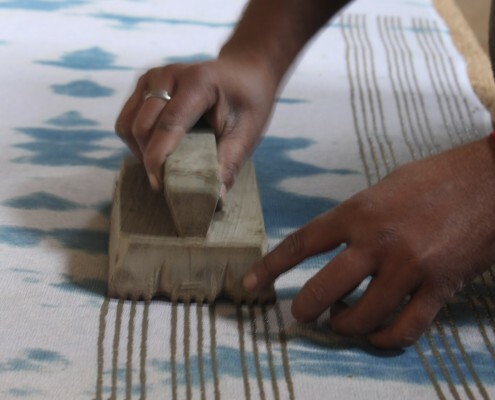 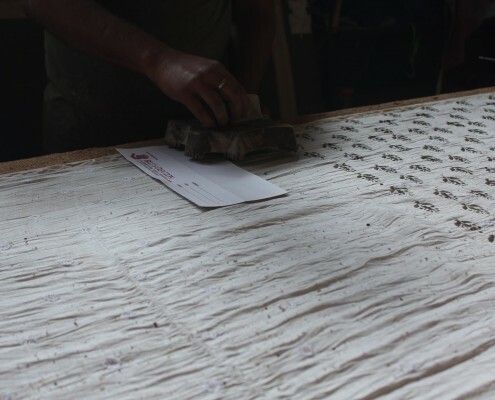 Abdul Rauf Khatri, a National Award Winner (2009) and a 10th generation textile artist practices ‘Ajrakh’ – a unique technique of hand block printing, one of the most complex hand printed textiles in the world. 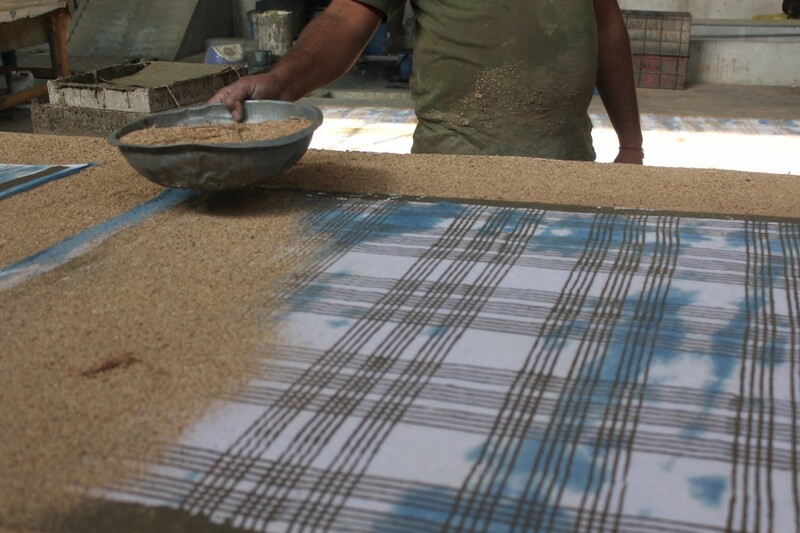 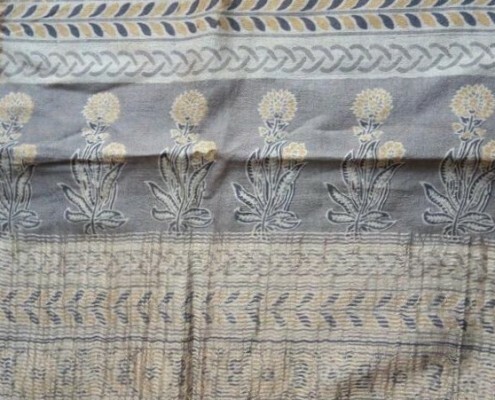 Born in Dhamadka into a family of traditional hand block printers, he learnt all about his craft from his grandfather – the late Khatri Mohammed Siddique who revitalised the use of natural dyes and played a key role in the preservation of Ajrakh and his father Abdulrazak Khatri – a National Award winning master craftsman. 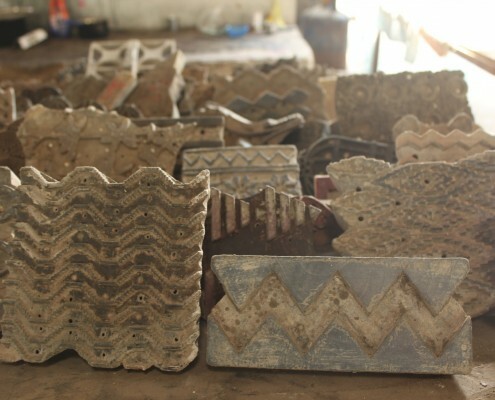 After the devastation of the 2001 Bhuj earthquake, the Khatris moved to Ajrakhpur where Abdul Rauf set up his workshop in 2010. 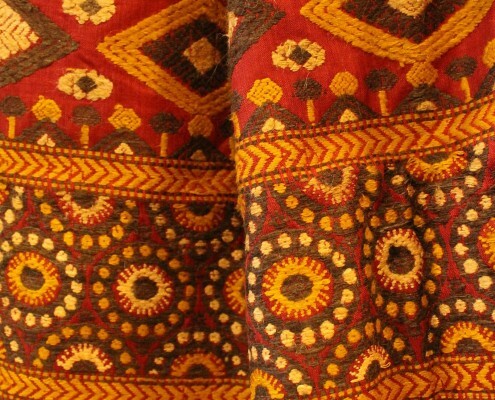 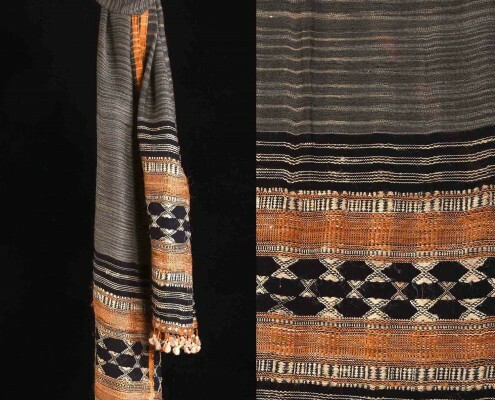 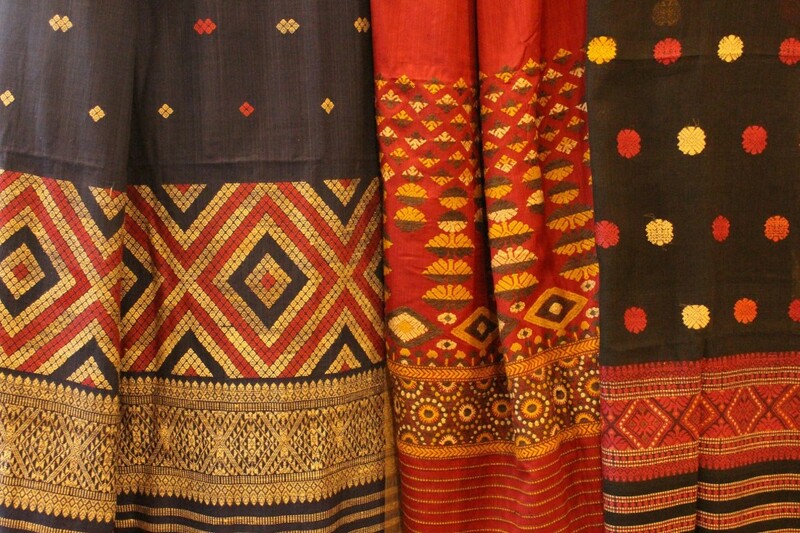 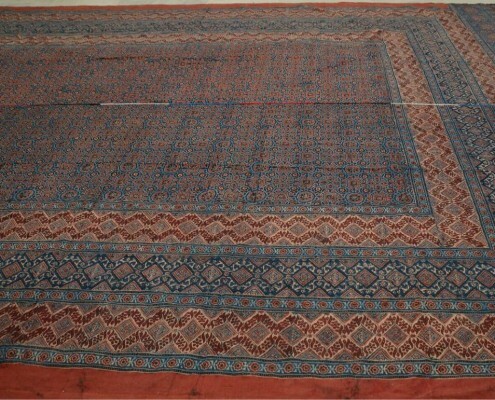 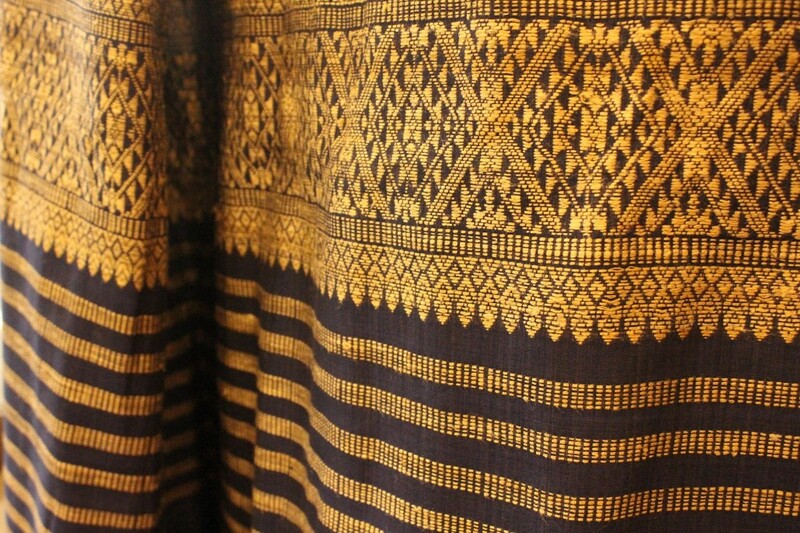 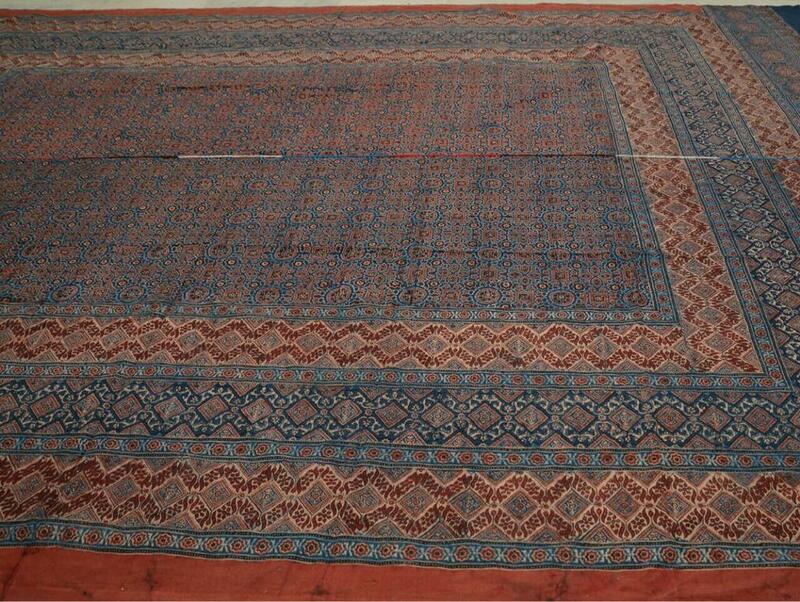 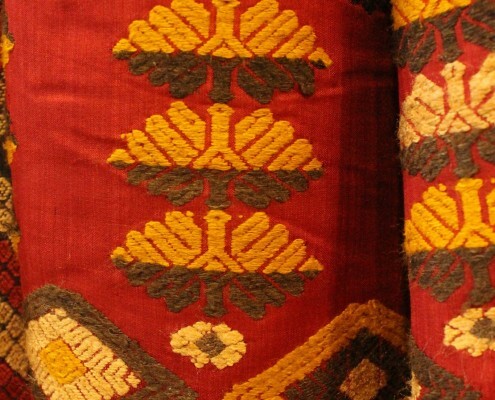 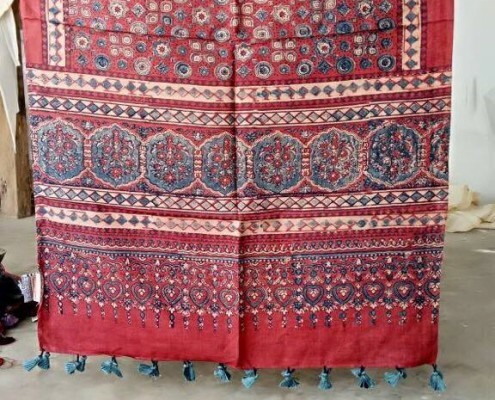 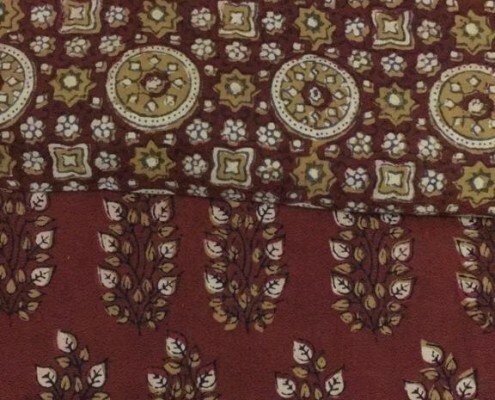 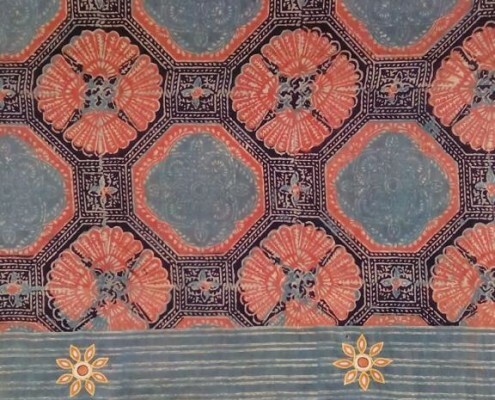 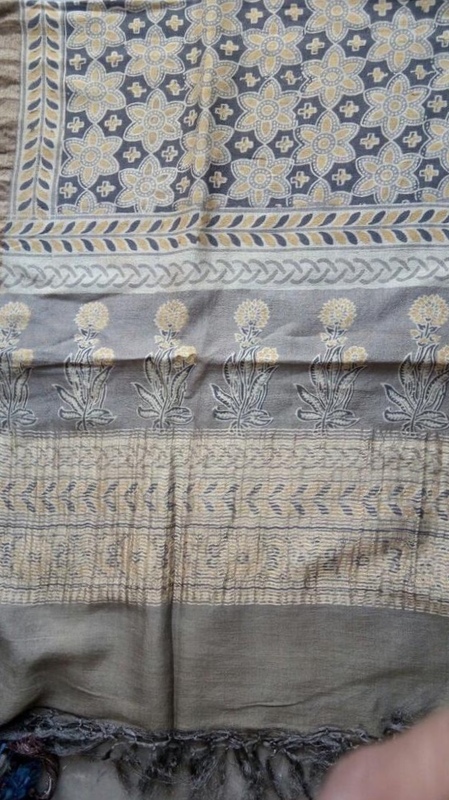 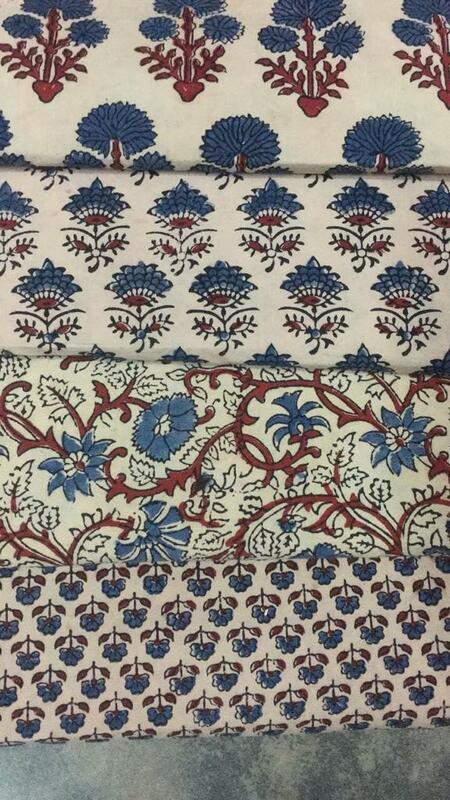 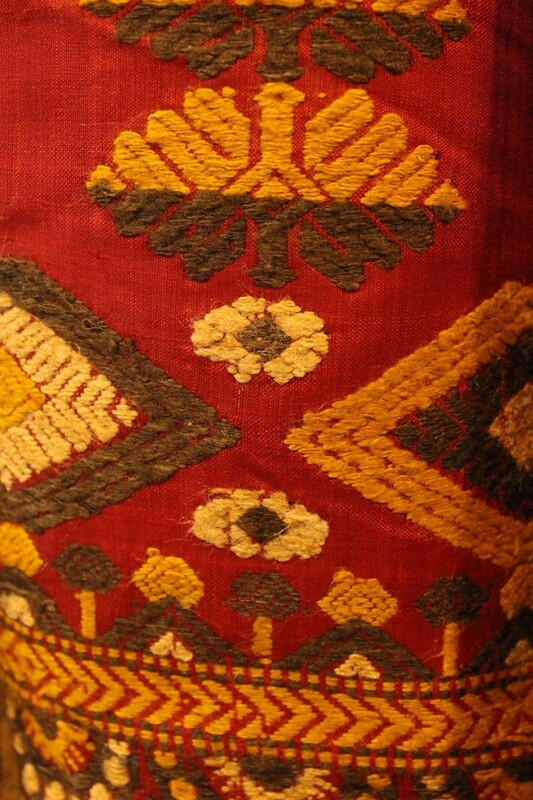 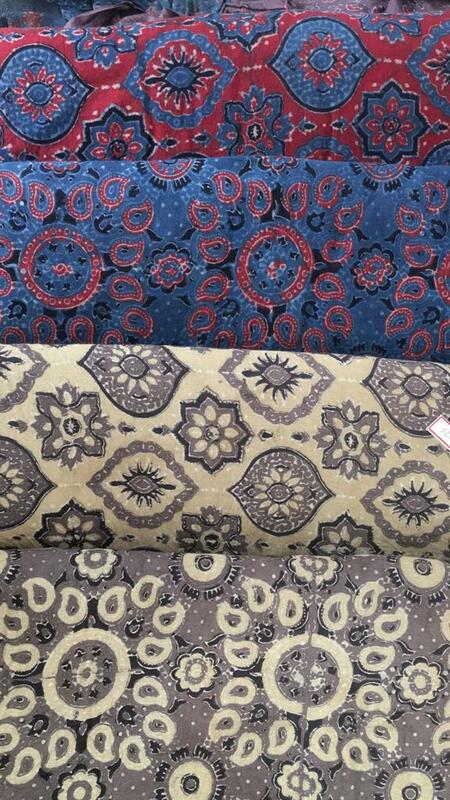 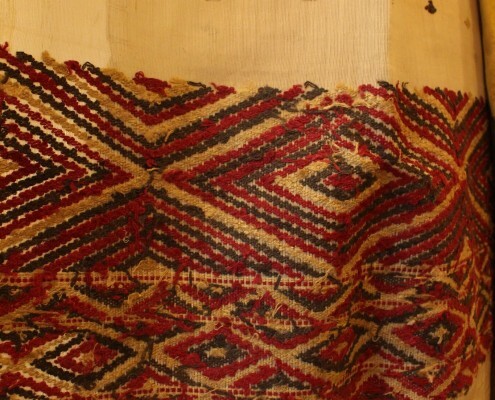 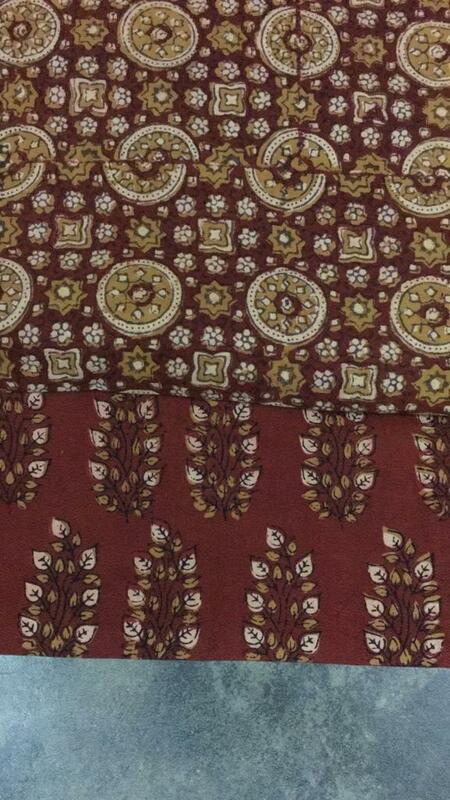 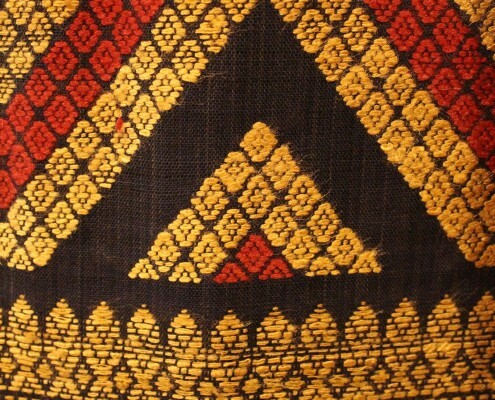 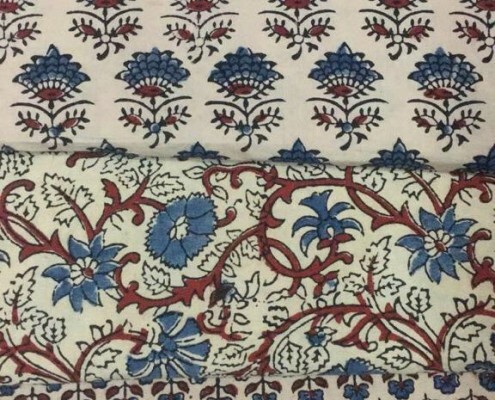 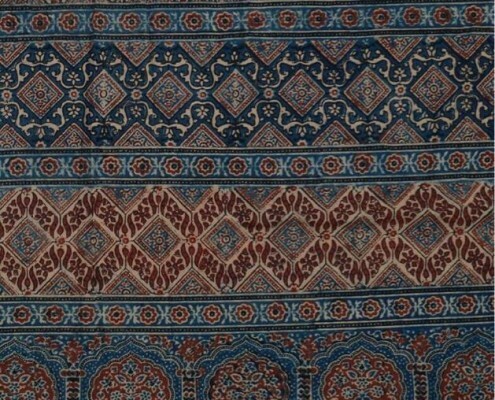 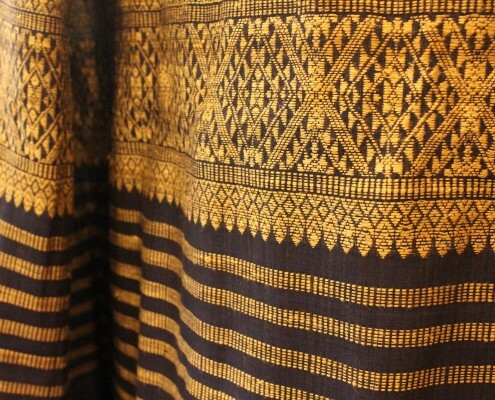 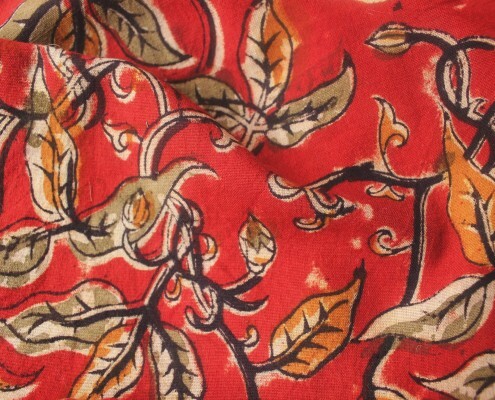 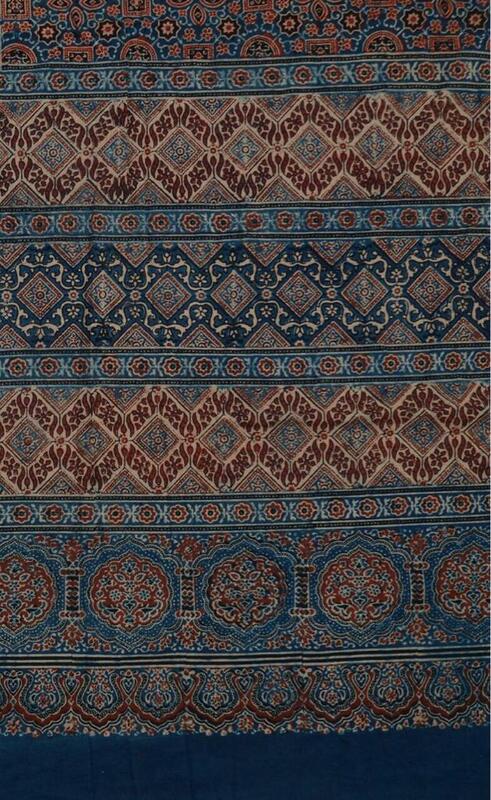 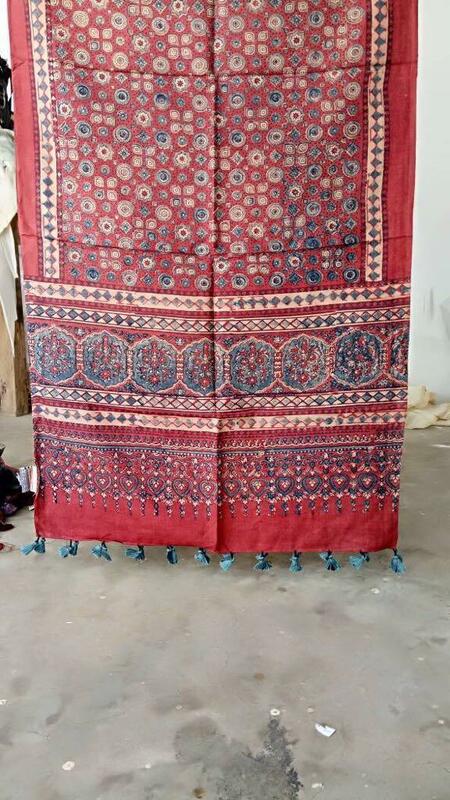 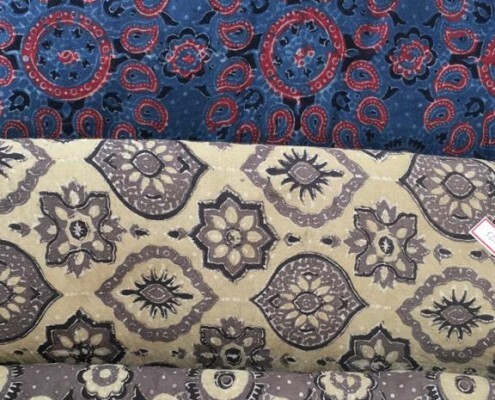 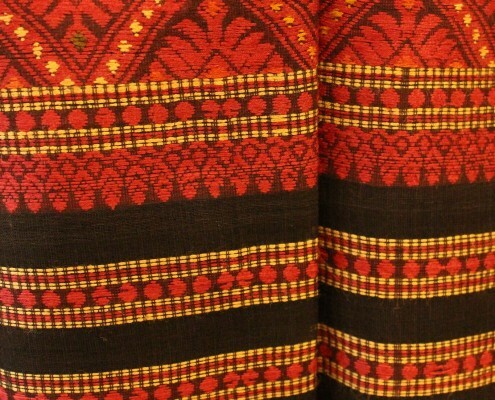 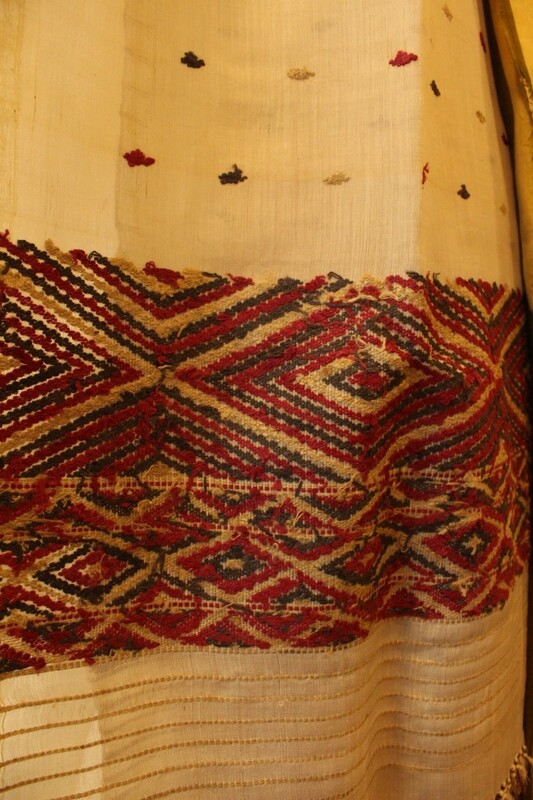 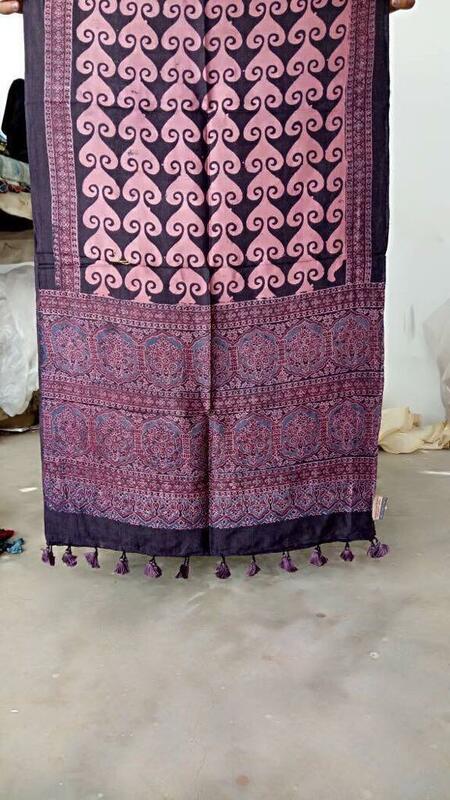 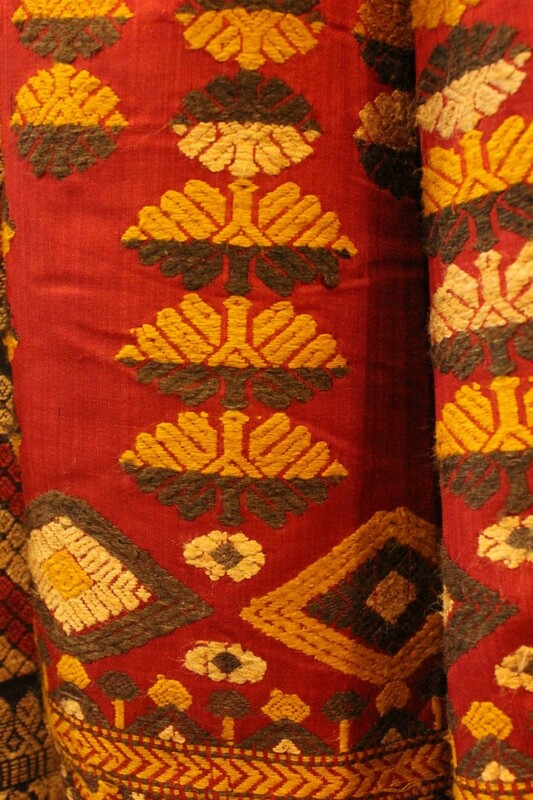 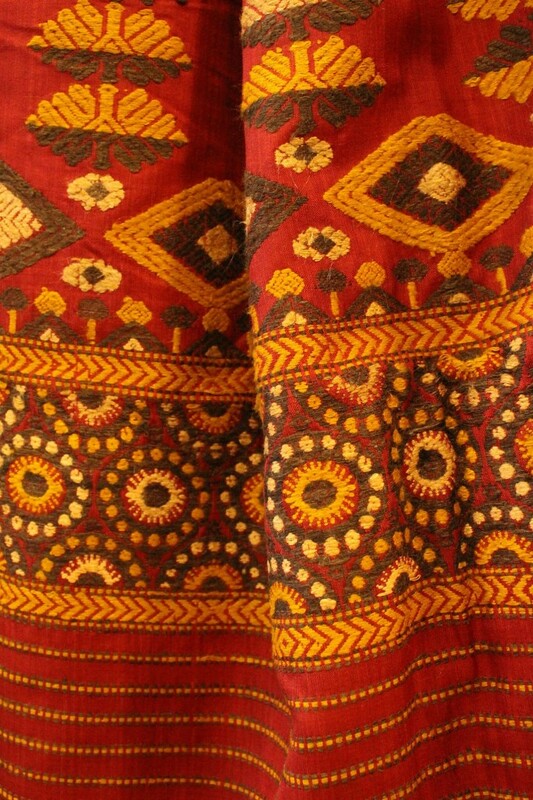 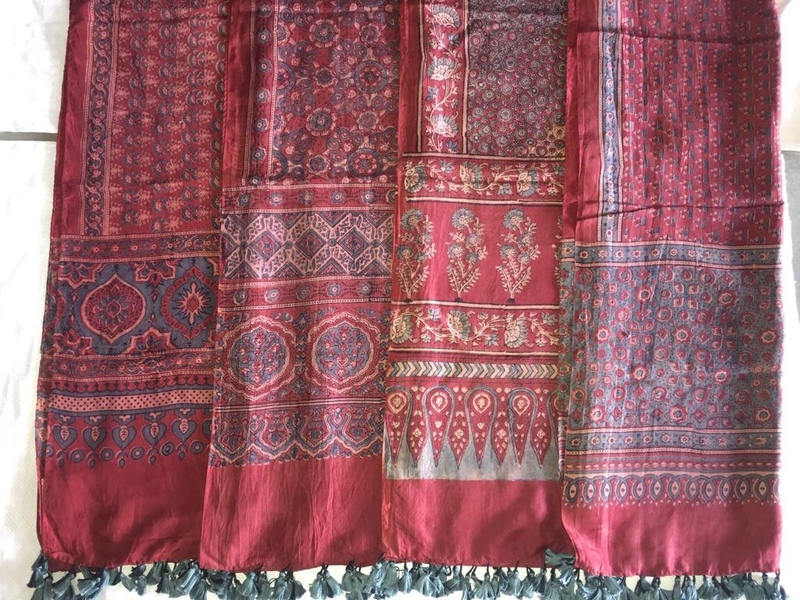 Abdul Rauf Khatri specializes in the traditional double sided Ajrakh textiles. 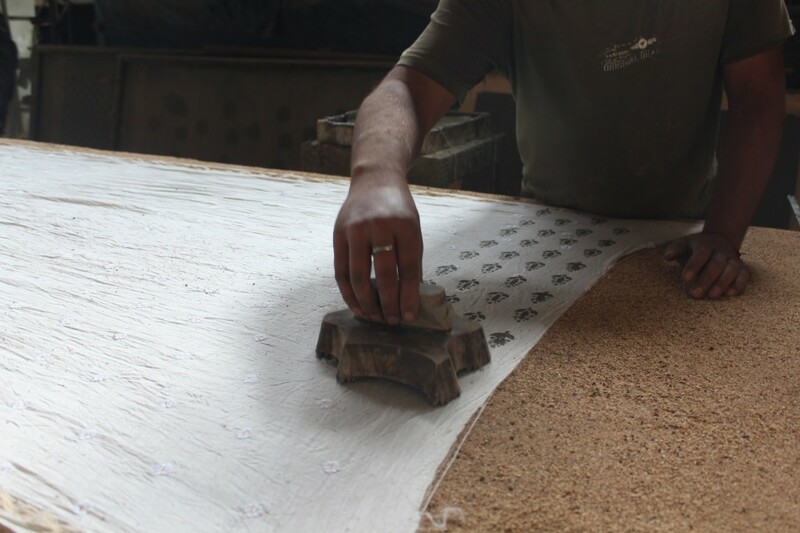 He does contemporary designs inspired by Islamic architecture and nature. 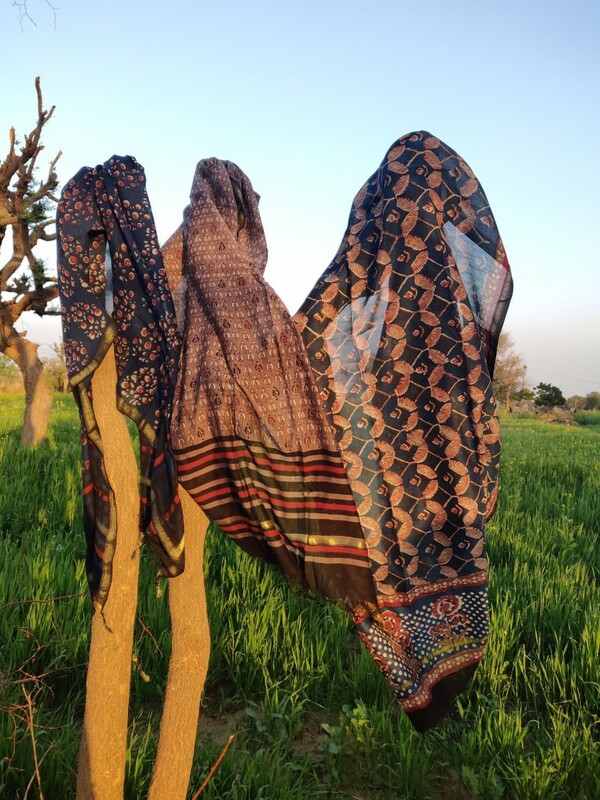 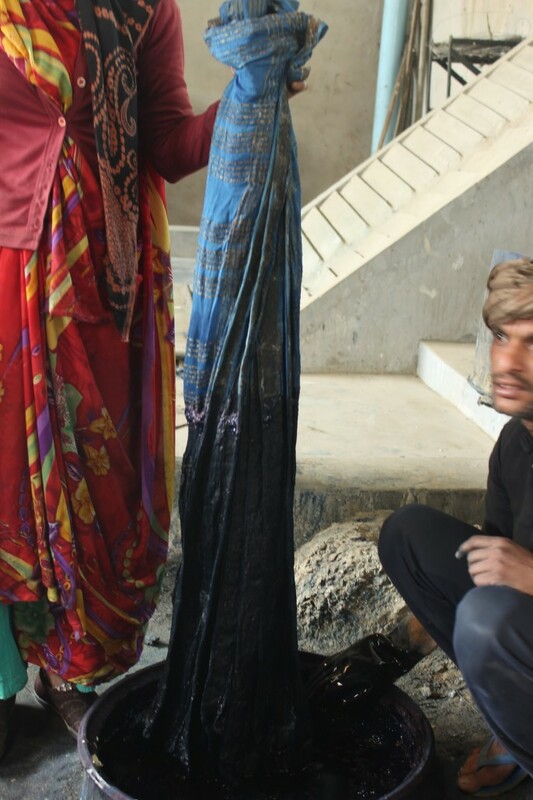 Good natural dyes, intricately carved wooden blocks and up to 18 steps of printing, dyeing and washing are the main ingredients of Ajrakh, but above all it is the skilled pair of hands which gives Ajrakh it’s magic touch. 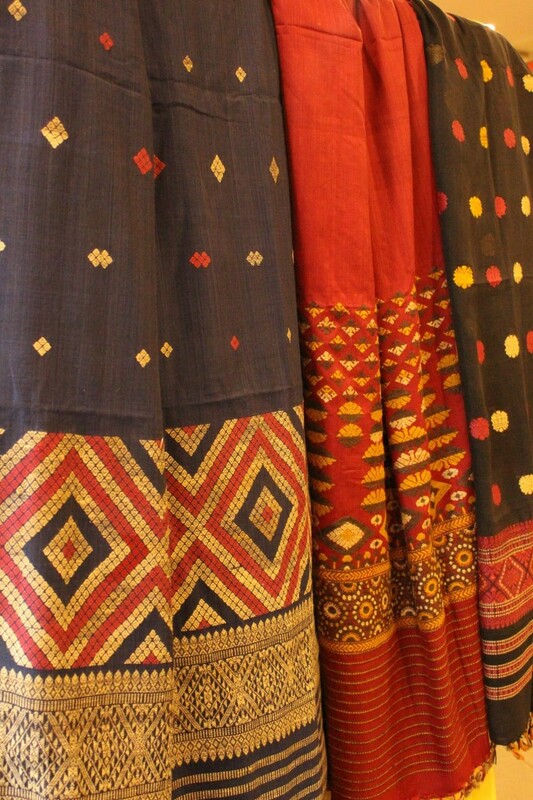 Khatri’s collection includes masterpieces of Ajrakh in geometric motif redolent with many colours in saris, fabric and dupattas. 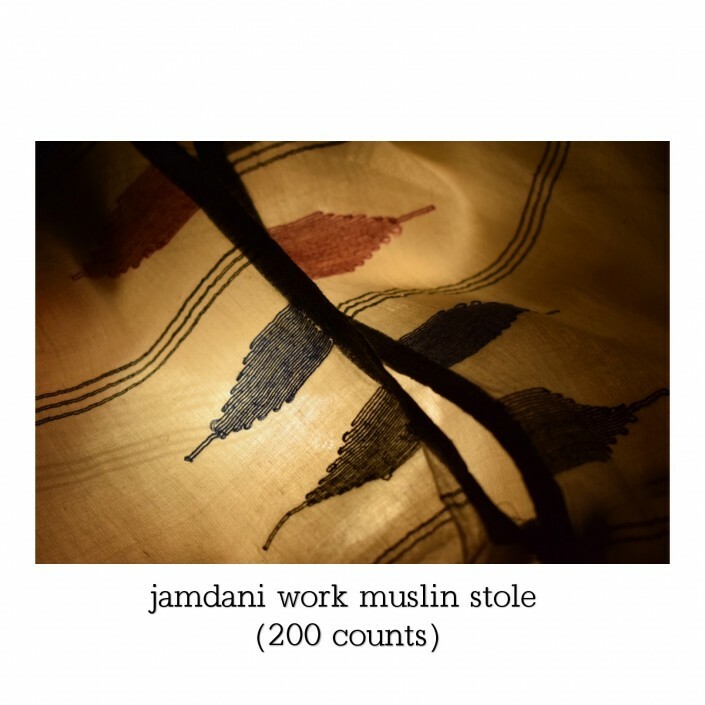 Bengal muslin was once the pride of India. 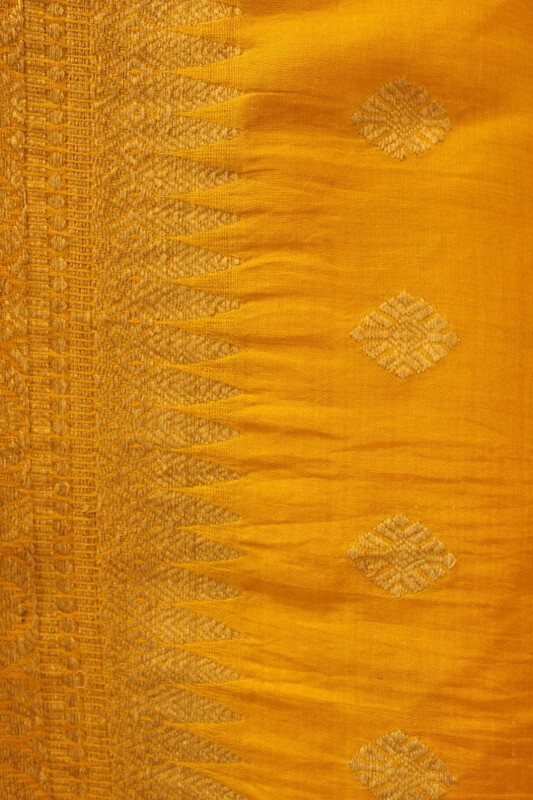 The region is renowned for its skilled weavers who produced high quality muslin and khadi fabric, an industry crushed by colonial exploitation. 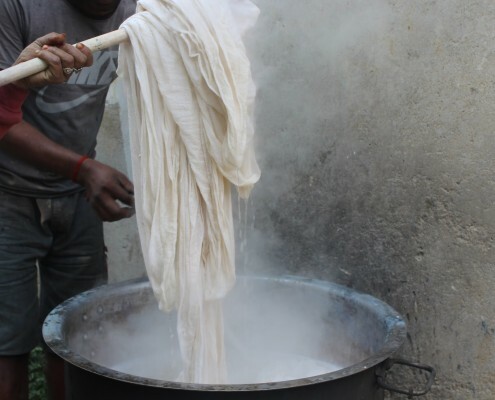 MG Gramodyog Sewa Sansthan (estd 2010) works at the village level stake holders to promote revival of muslin, khadi and handloom product and all the desi cotton varieties. 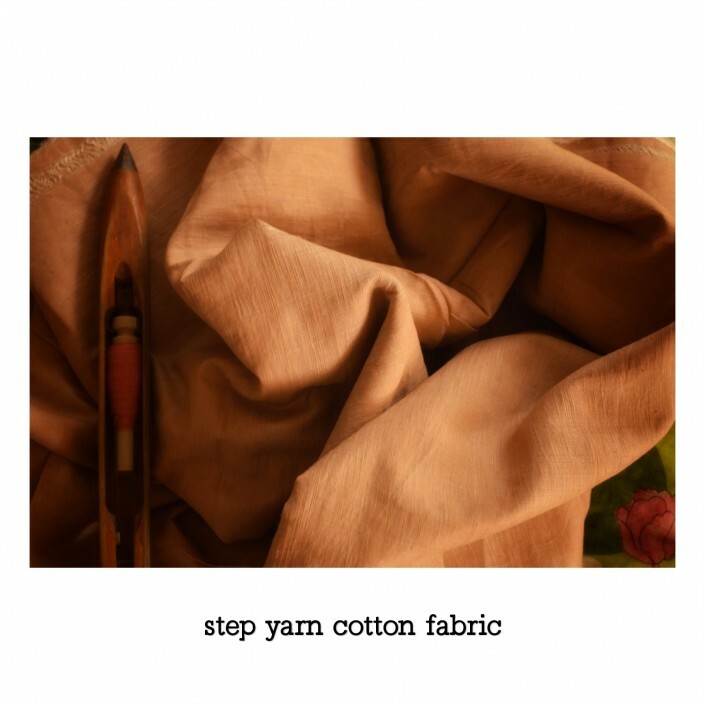 On display at ‘Dye Natural’ are Indigenous variety short staple cotton fabric natural dyed, handspun by Ambar Charkha (not solar), handwoven by bamboo reed loom (and not iron). 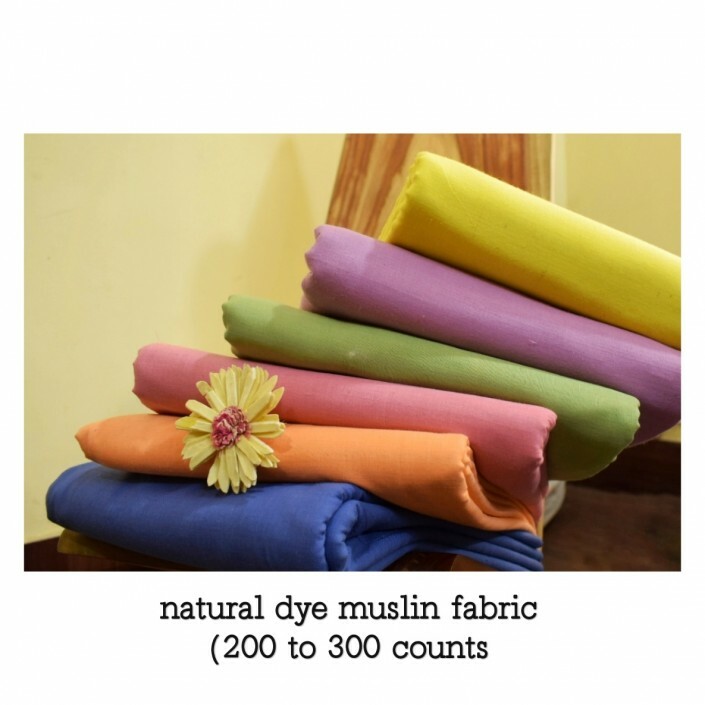 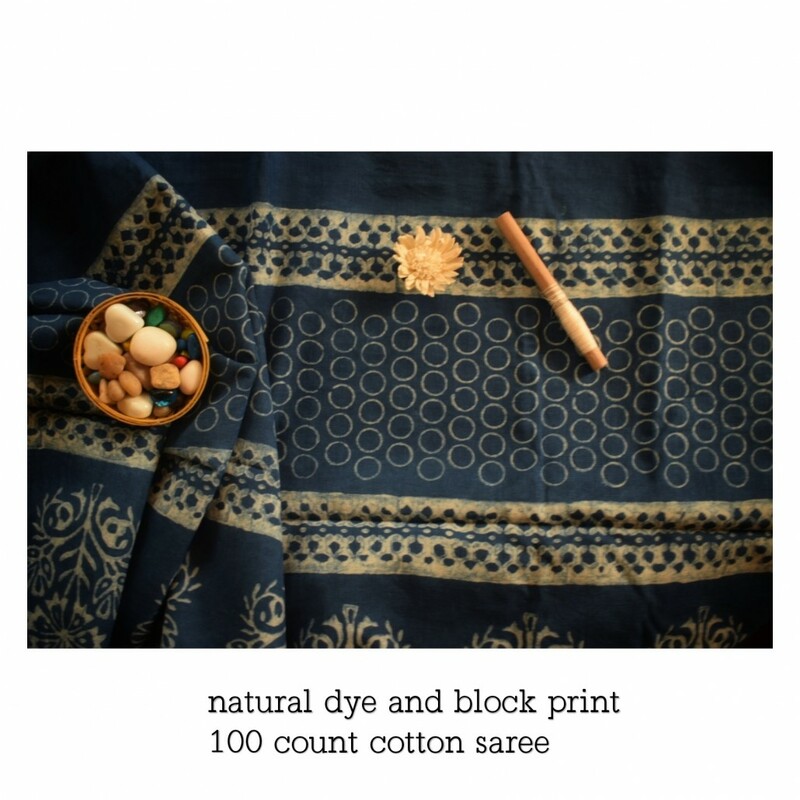 Also Indigenous cotton, natural dyed muslin & kora fabric, saris, stoles, dresses up to 300 khadi counts. 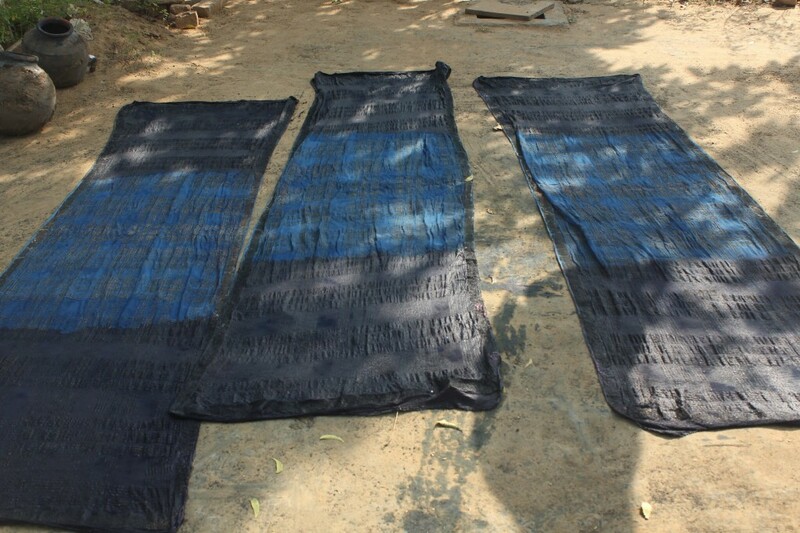 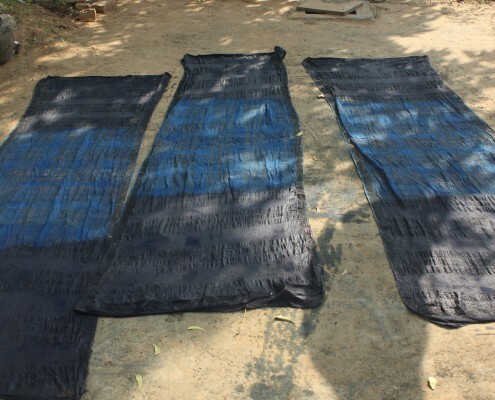 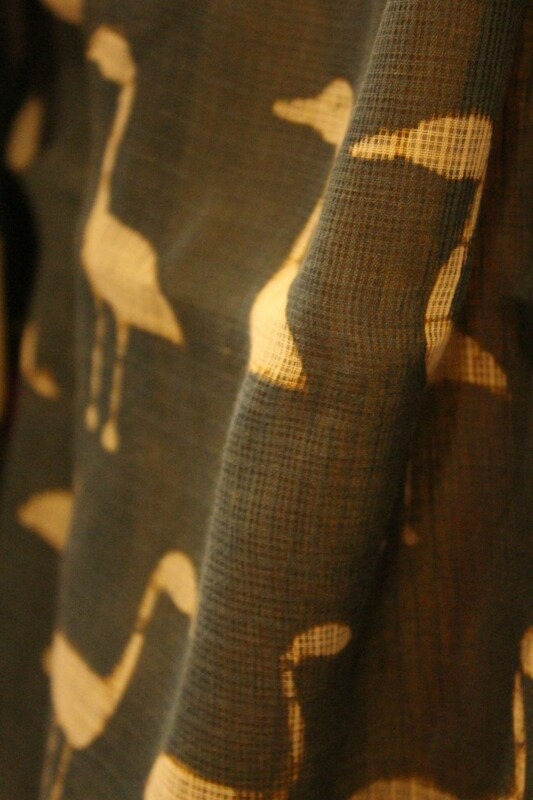 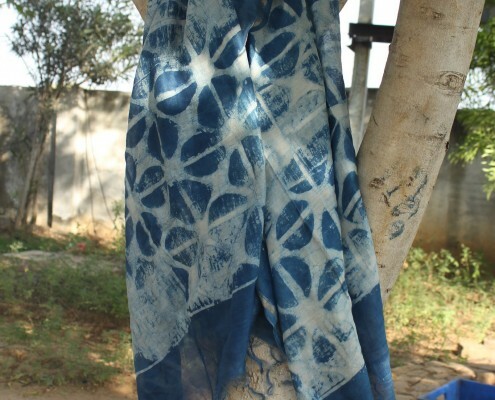 Saris with Jamdaani work, muslin indigo dyed sari with block prints. 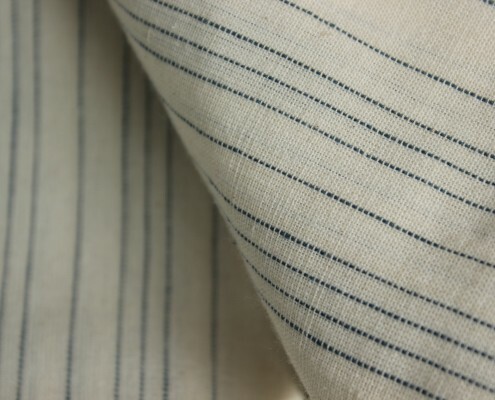 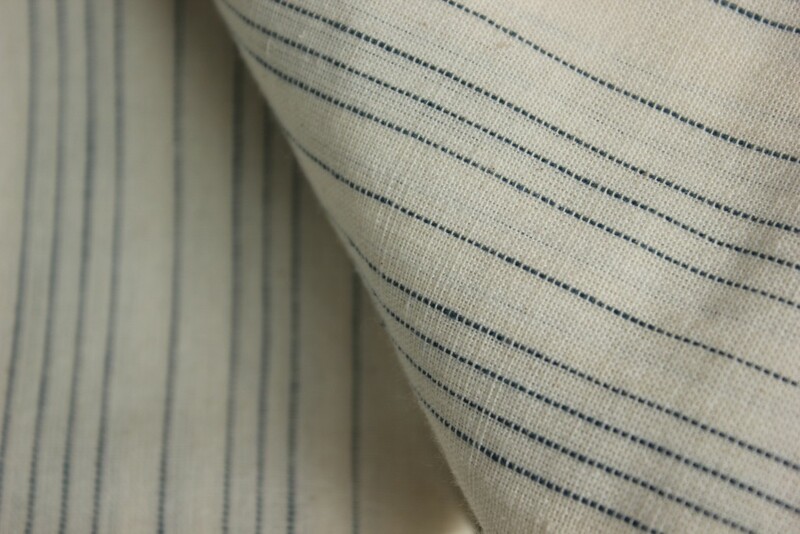 MGGSS weavers can weave upto 500 Khadi count Muslin fabric. 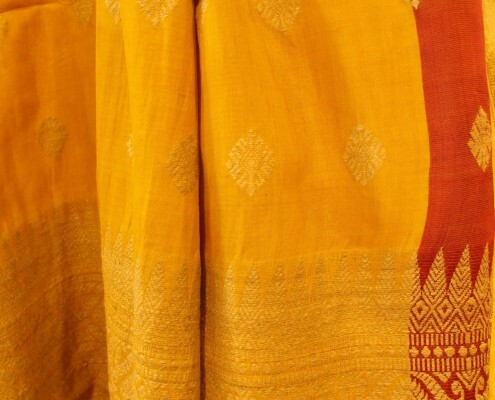 Dastkar Andhra Marketing Association works with handloom weavers in Andhra Pradesh & Telangana. 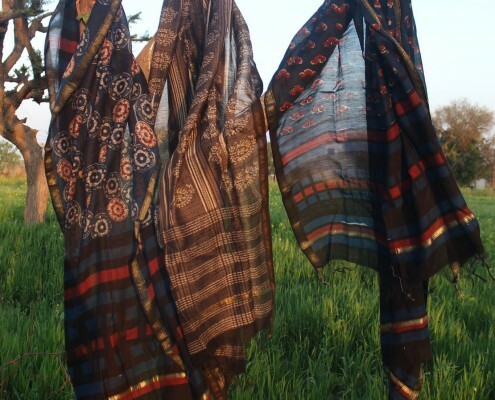 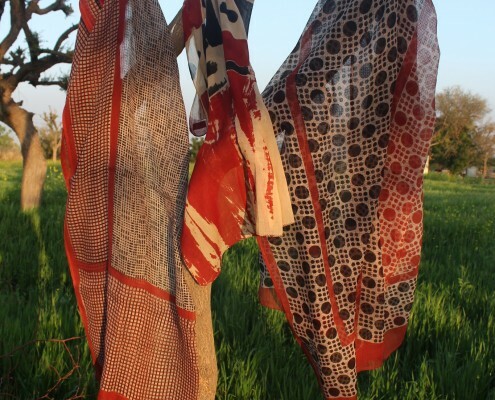 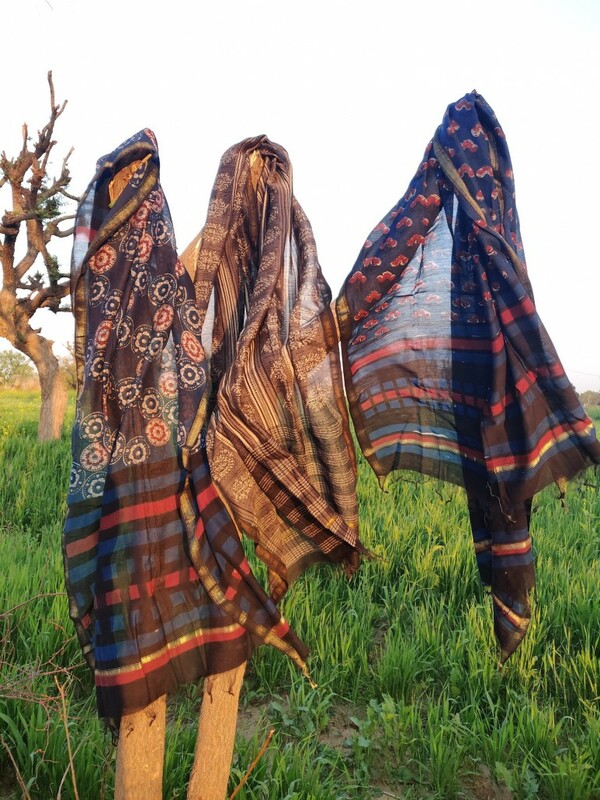 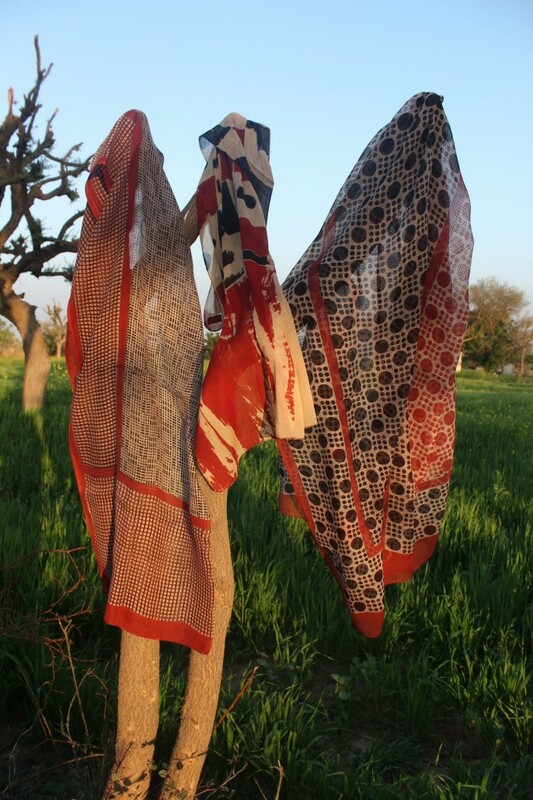 DAMA has been producing natural dyed yardage, dupattas and sarees for the last 20 years. 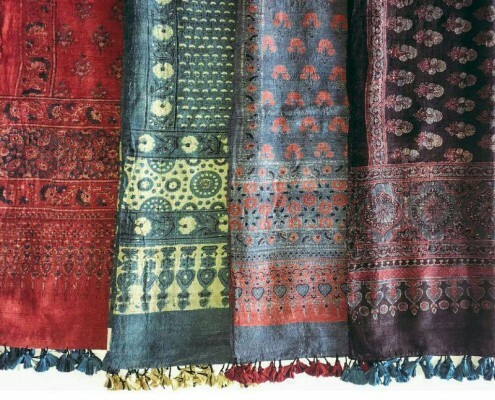 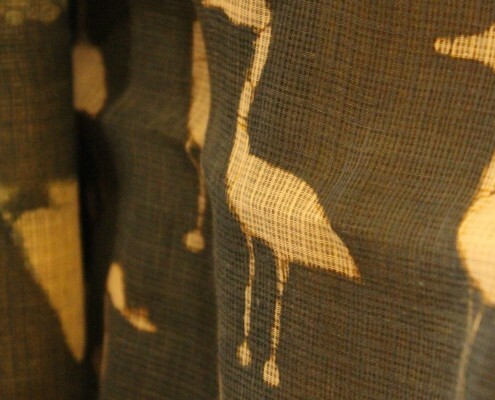 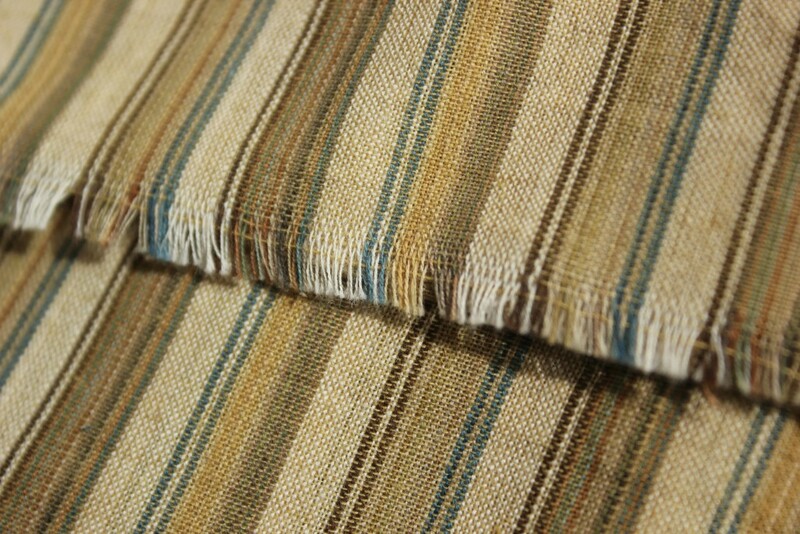 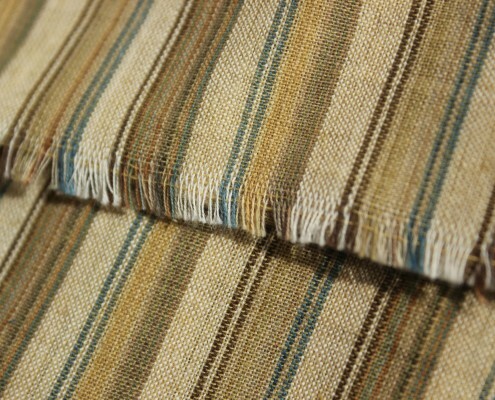 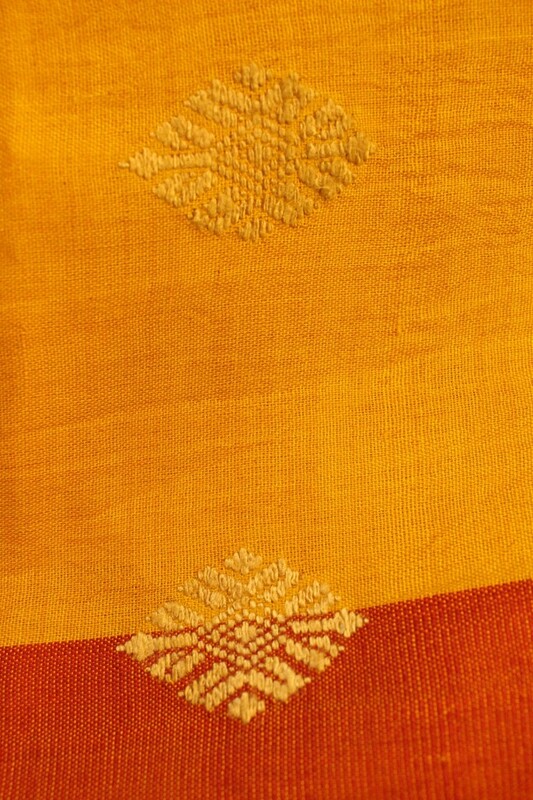 The range of handloom products come in different textures and natural colours. DAMA’s natural dye colour palette consists of anar (yellow), katha (brown), indigo (blue), ratanjoth (grey), alizarin (red), iron solution (black), etc. 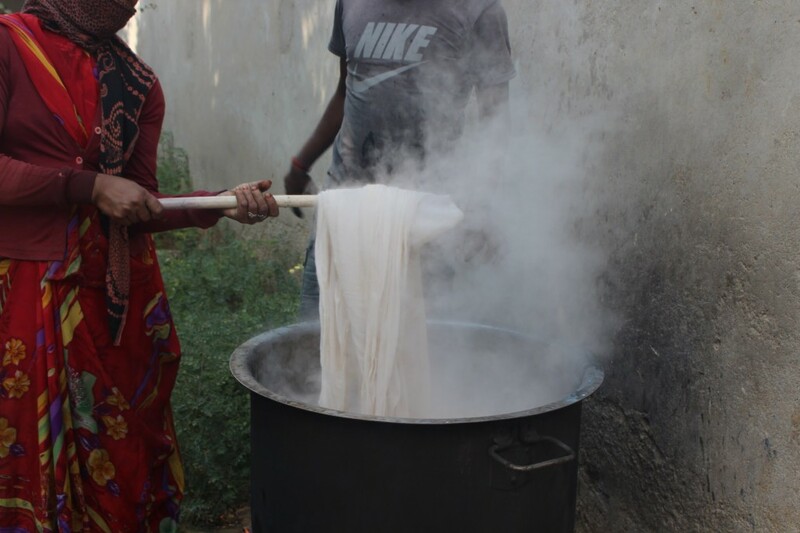 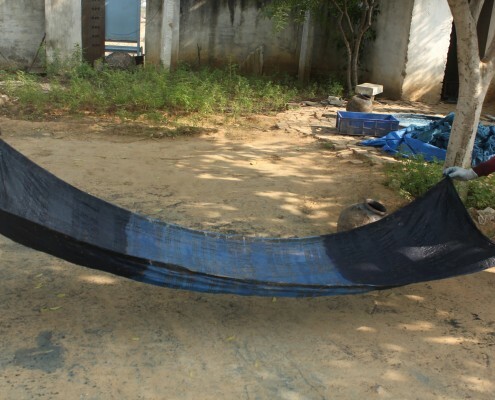 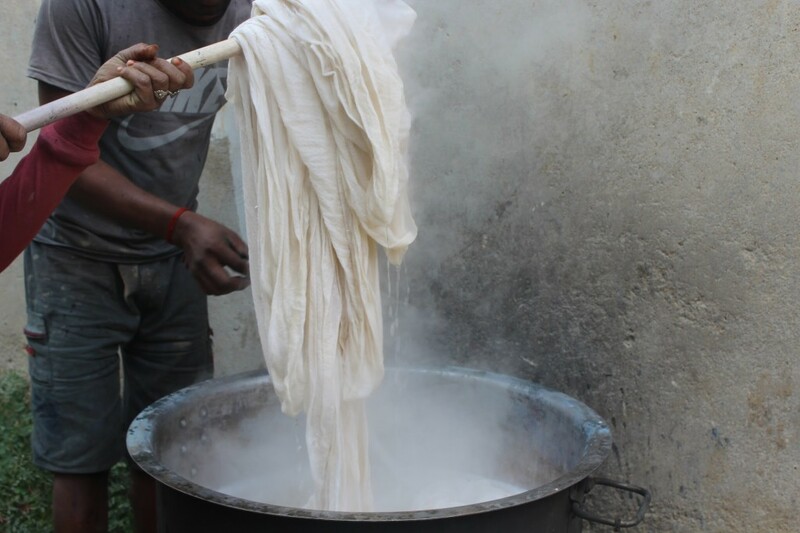 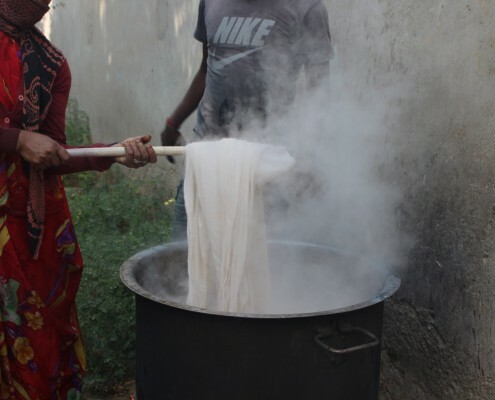 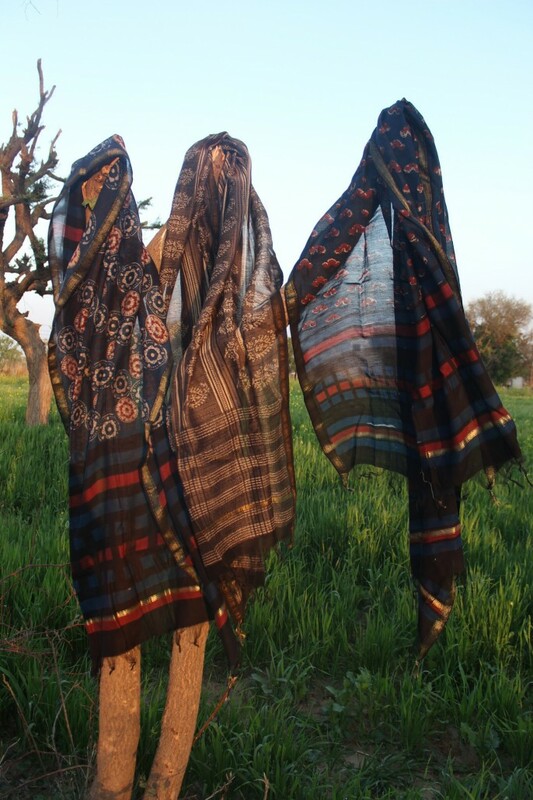 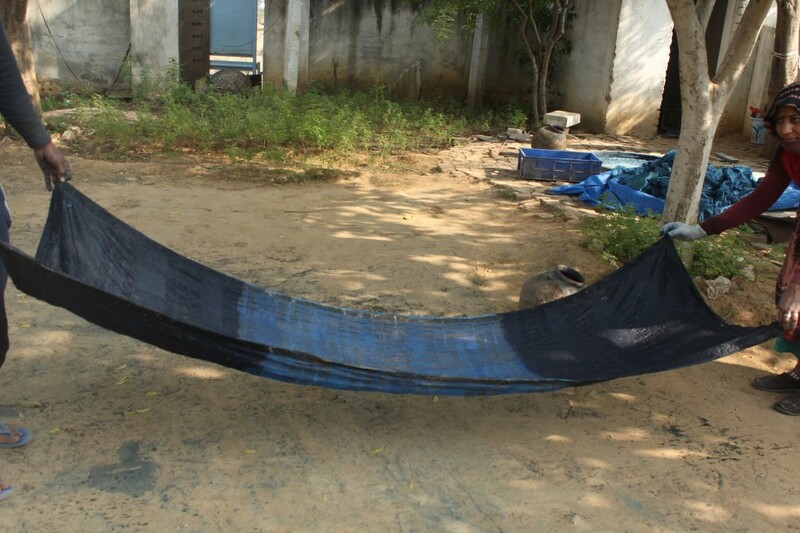 DAMA has trained weavers and dyers in natural dyeing in the villages of Andhra and Telangana and produces large quantities of natural dyed products. 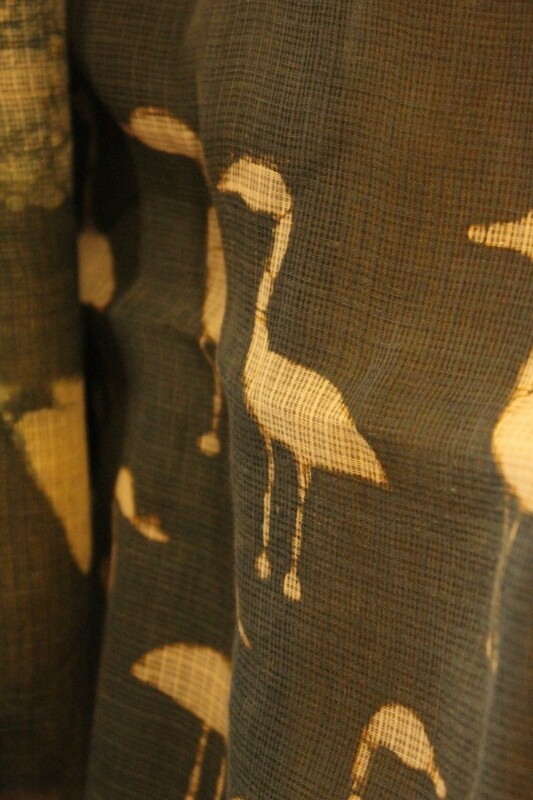 Look out for saris, yardage, dupattas in lyrical shades of nature and impeccable weaves from DAMA at ‘Dye Natural’. 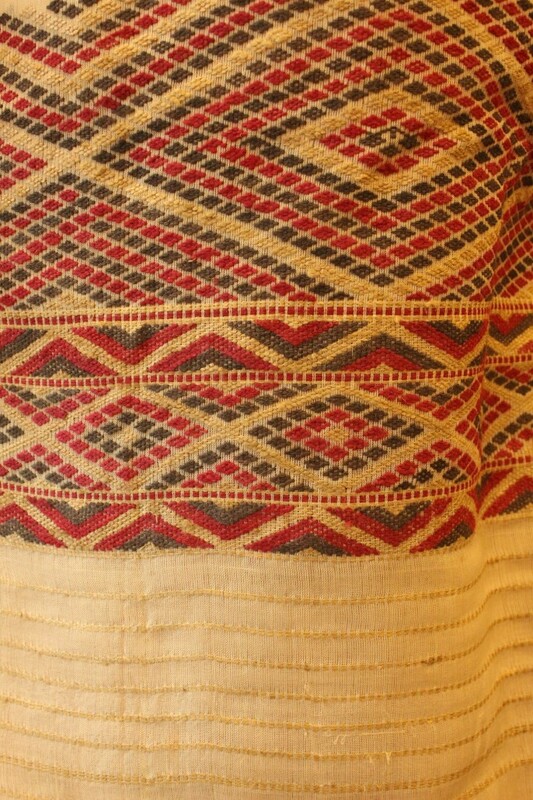 Anuradha Kuli is a master weaver from the Upper Assam region and weaves exquisite saris based on the traditional Mekhla of Assam. 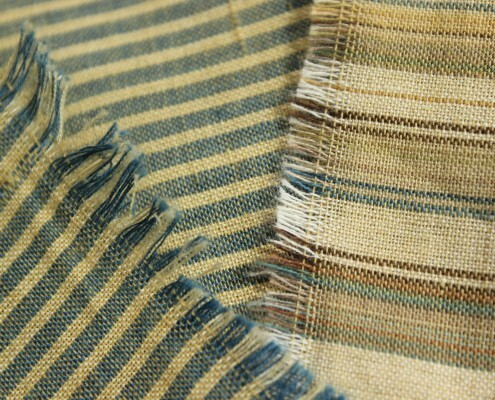 She brings an innovative touch to each piece she weaves or designs. 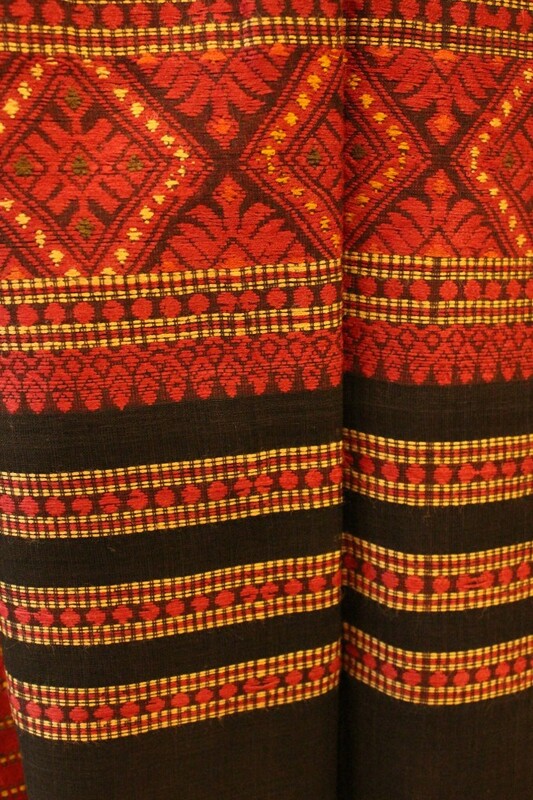 According to her, each tribe does a variation of the Mekhla and hers follow the patterns and colour palette popular with the Miri tribe of Assam. 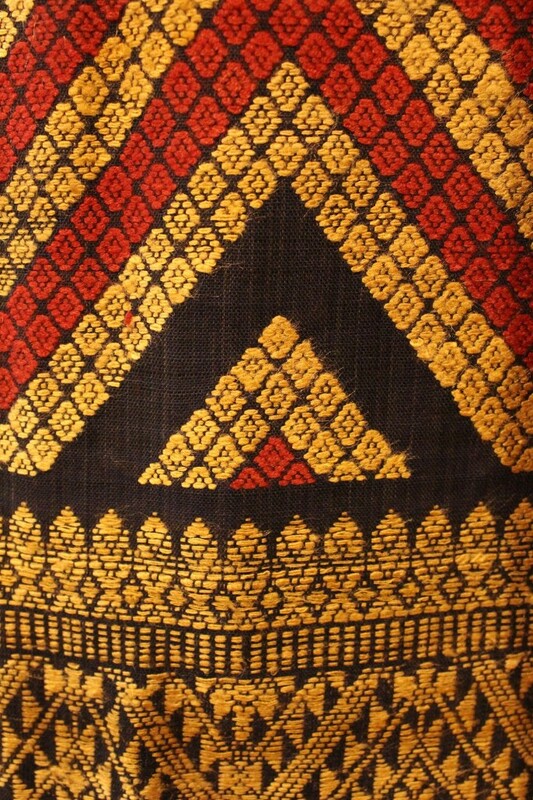 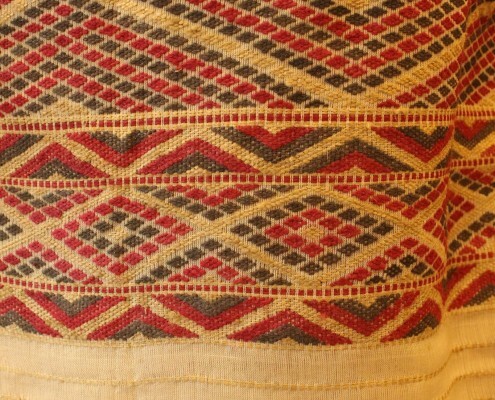 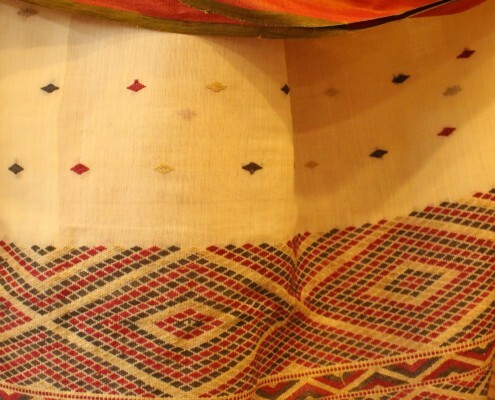 Some of the common motifs which feature in her weaving are the barti or diamond pattern, the fan pattern and the ‘gol butti’. 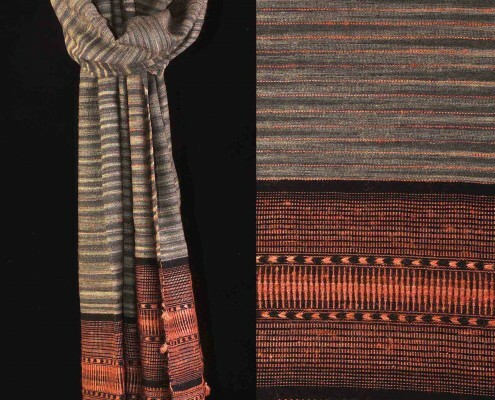 Her collection also includes saris made from the muga silk yarn. 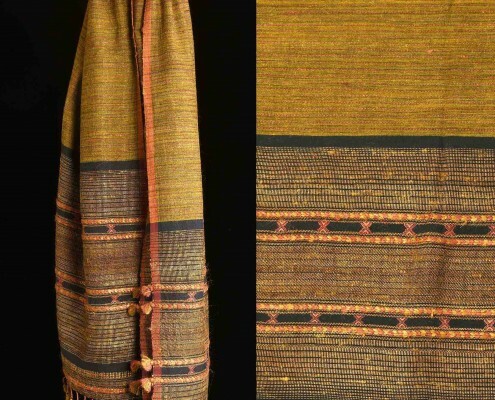 She has trained a number of young weavers and due to her excellent marketing skills has made this special weave of Assam a much coveted item. 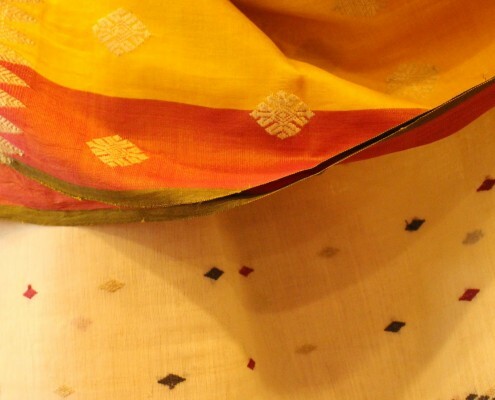 In fact she could even be said to have introduced an addition to the sari repertoire of the state. 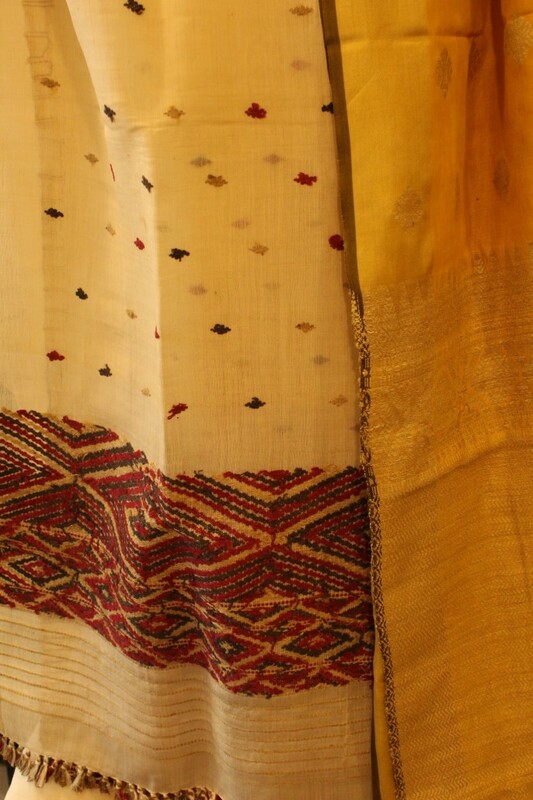 In ‘Dye Natural’ she presents Saris and Mekhala chadars in jewel colours in handwoven pure mulberry silk with natural dyes. 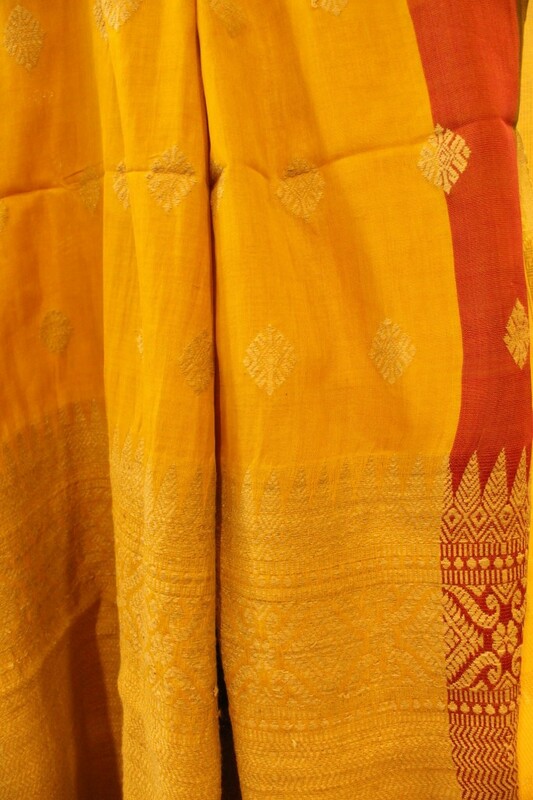 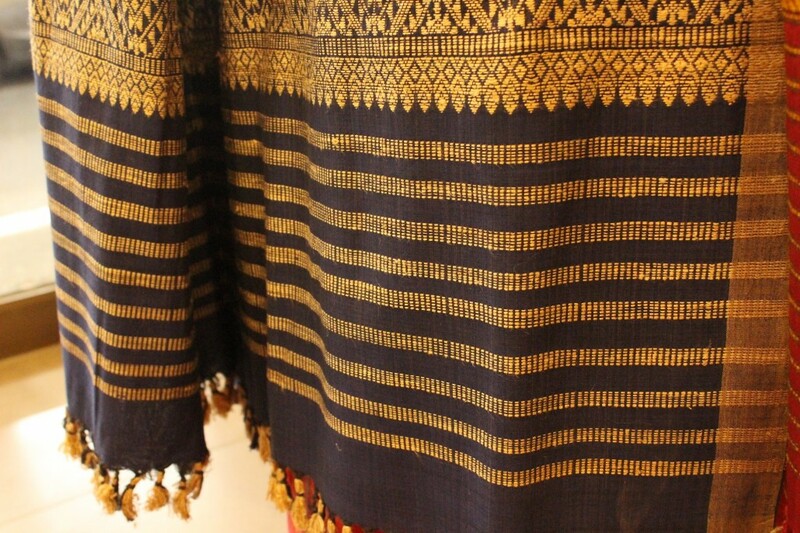 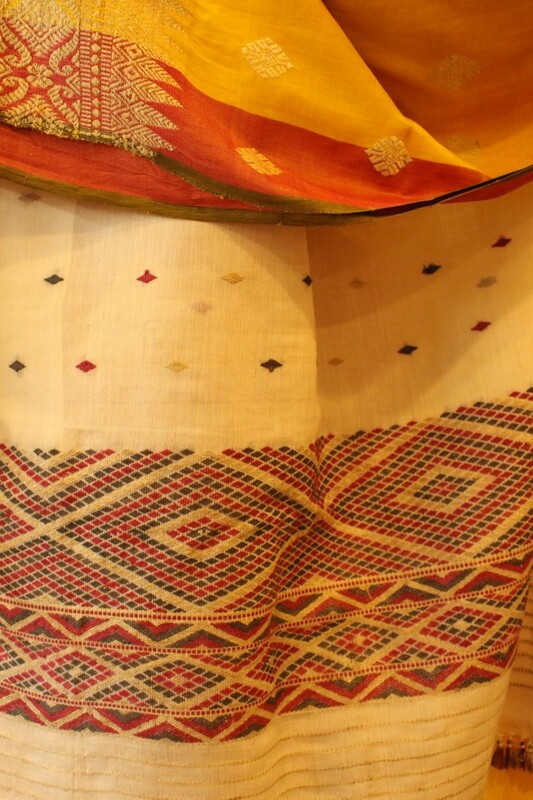 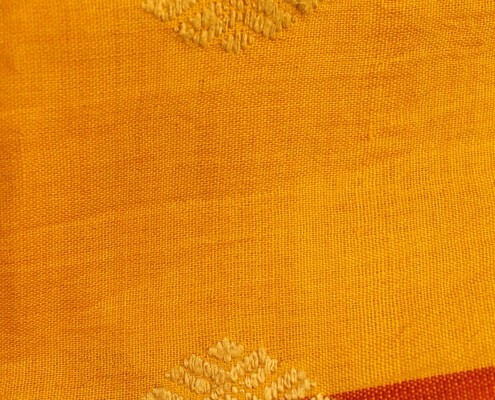 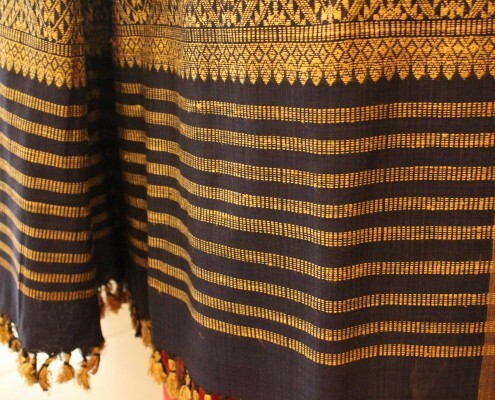 Silk cotton saris with the lyrical design portions featuring only Eri silk. 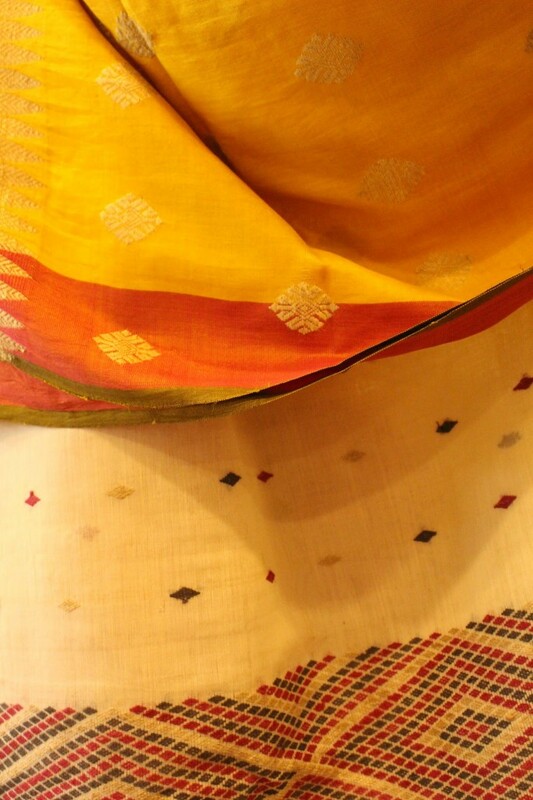 Eri and muga saris in brilliant colours along with silk cottons for festive and special occasion wear. 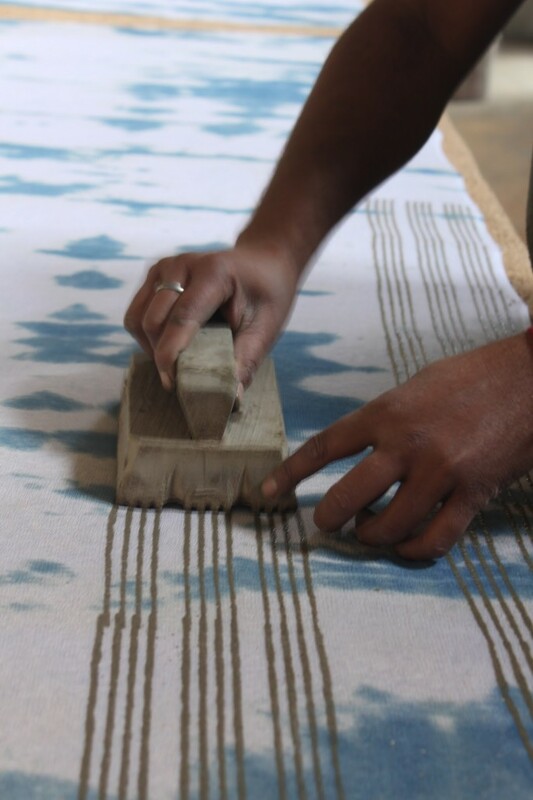 Brij Ballabh Udaiwal’s work are steeped in the dyes of Sanganer in Jaipur which could well be called the capital of textile printing in India. 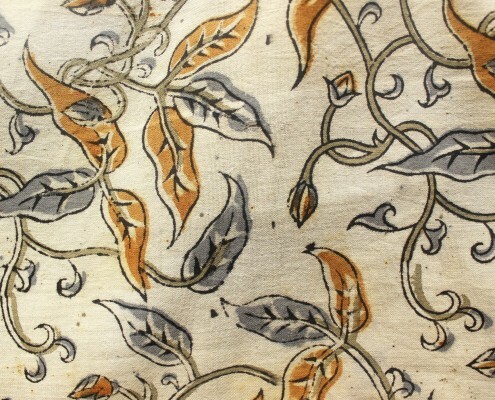 Brij Ballabh works with all the shades of natural dyes produced from plants, stone, etc, using the mud resist technique. 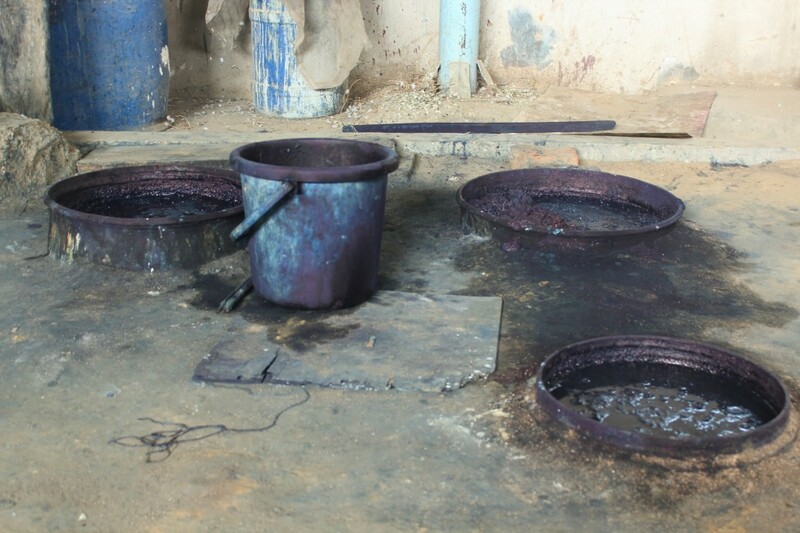 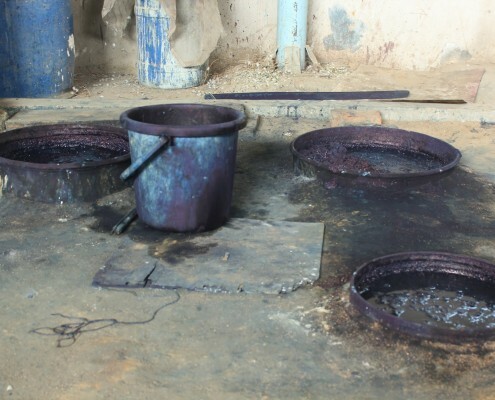 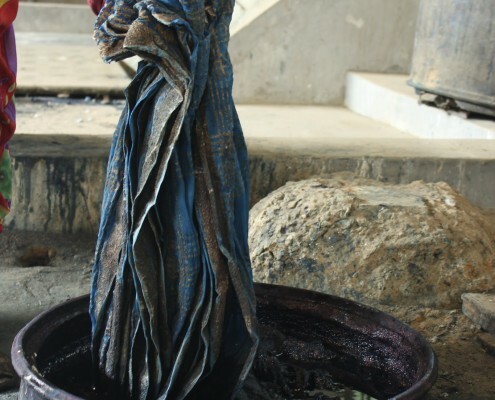 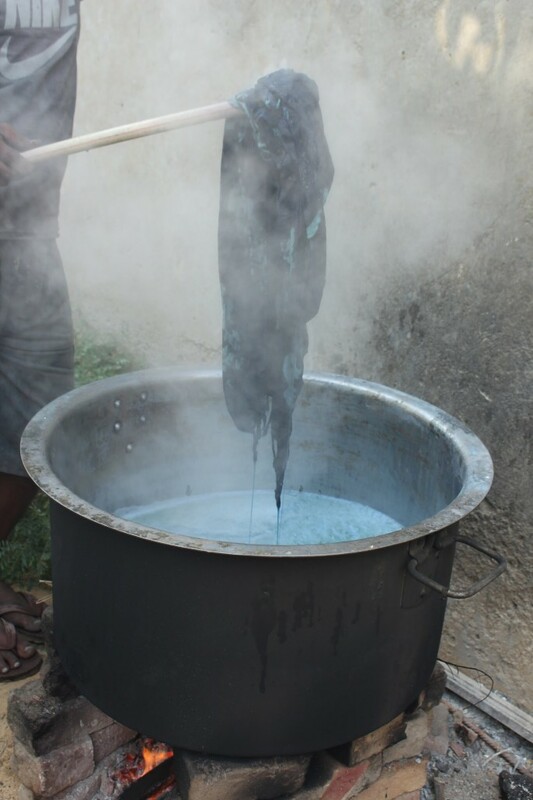 Indigo, a magical and complex dye is a favourite of the artisan. 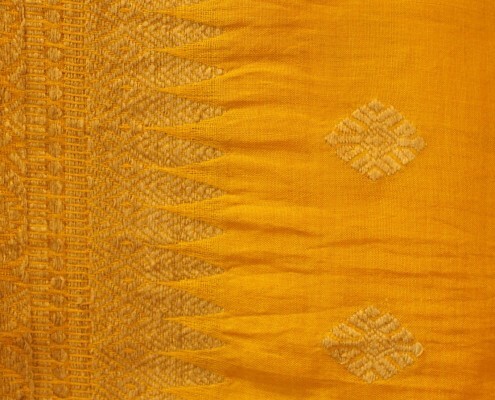 It is made in vats by the dyers of Jaipur. 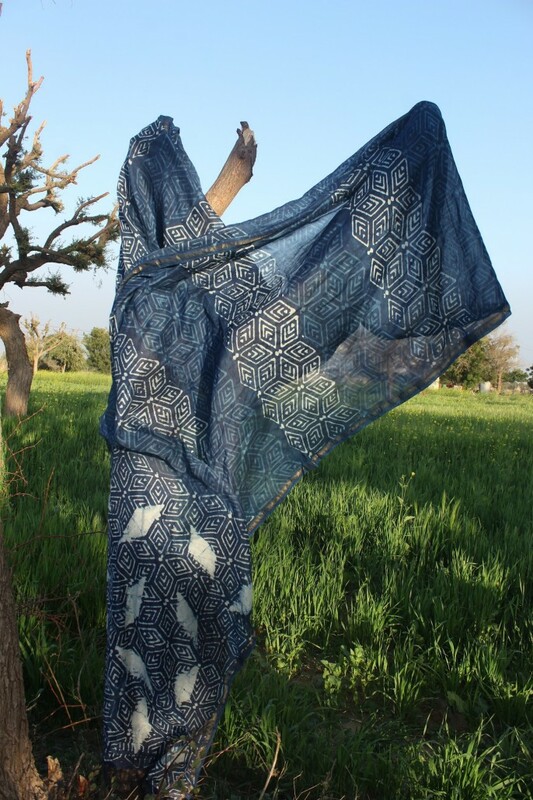 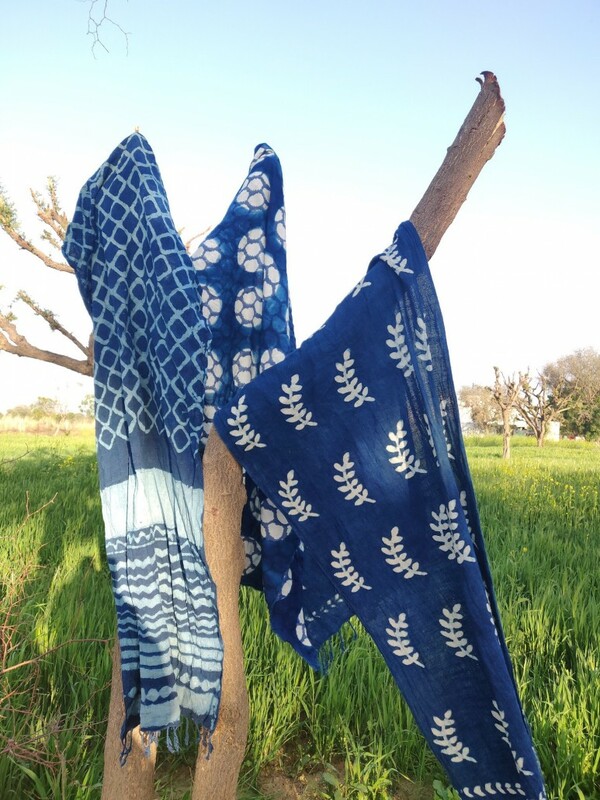 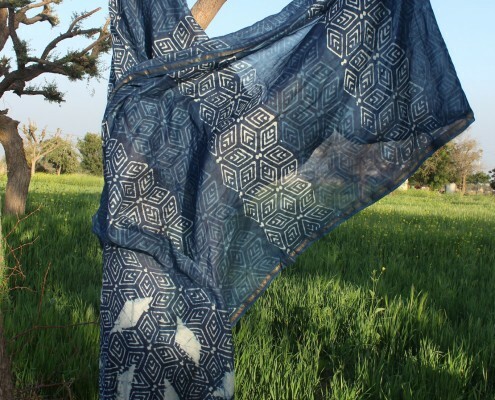 Brij Ballabh’s collection at ‘Dye Natural’ includes a mesmerising collection of indigo dyed and block printed saris, dupattas, stoles; fabrics in an amazing range of motifs and in Shibori is available in the range. 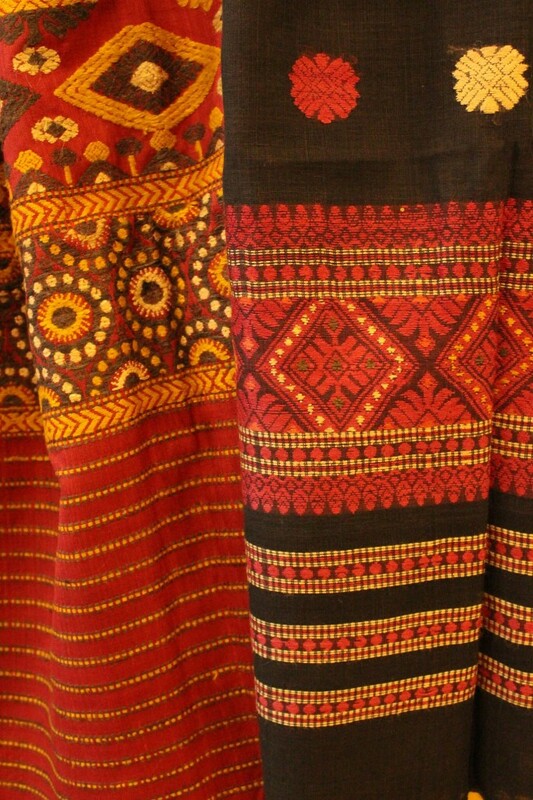 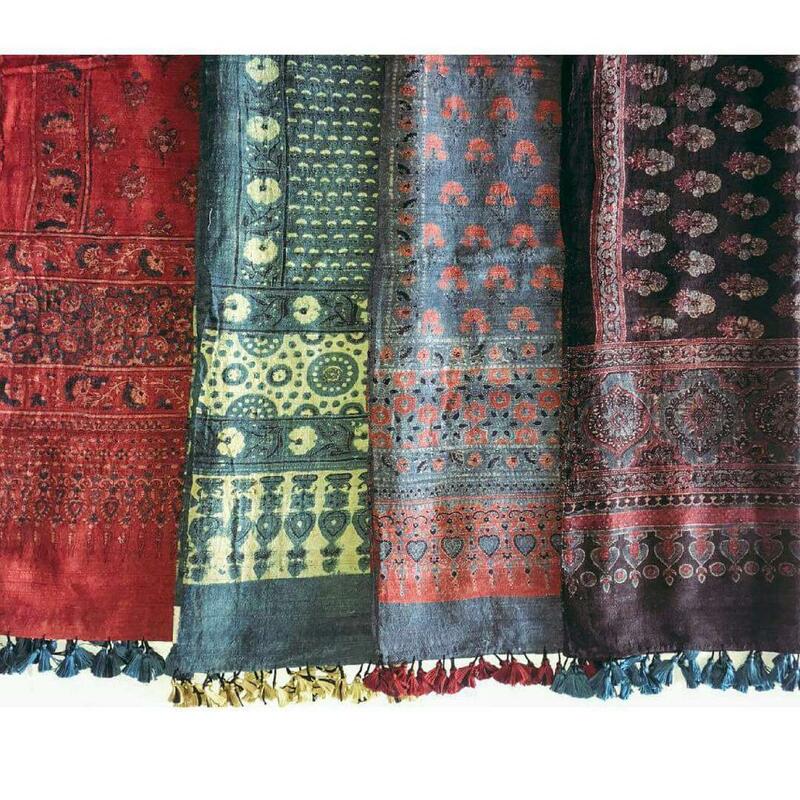 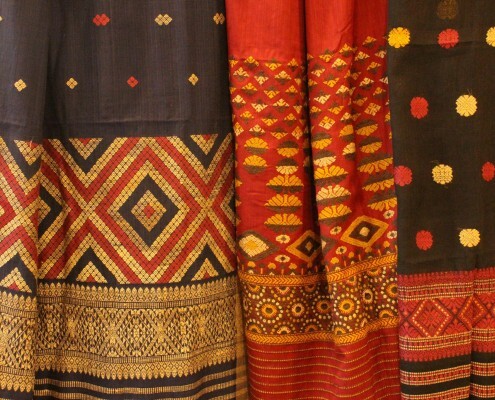 A vast collection of hand block printed saris, dupattas, etc in red, black, blue, green, in a confluence of colours or in monochromes.